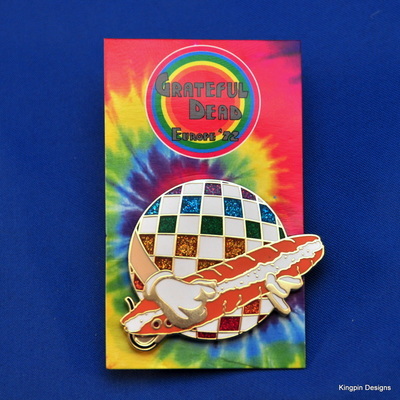 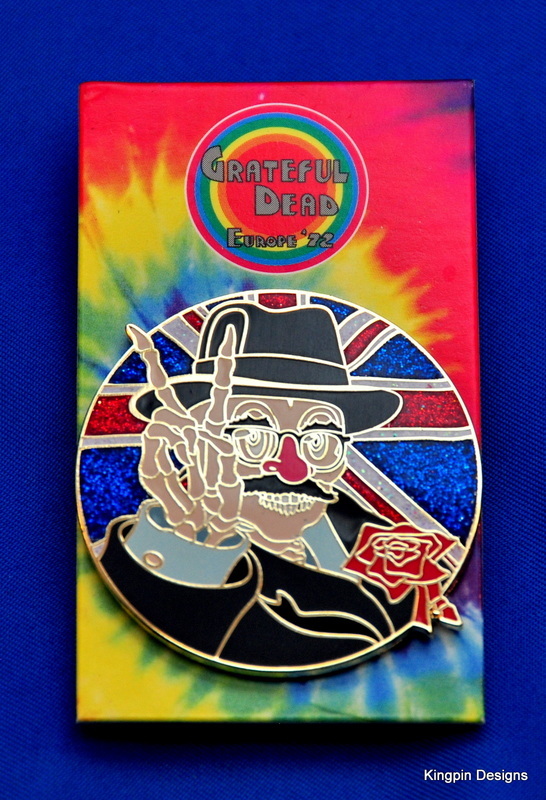 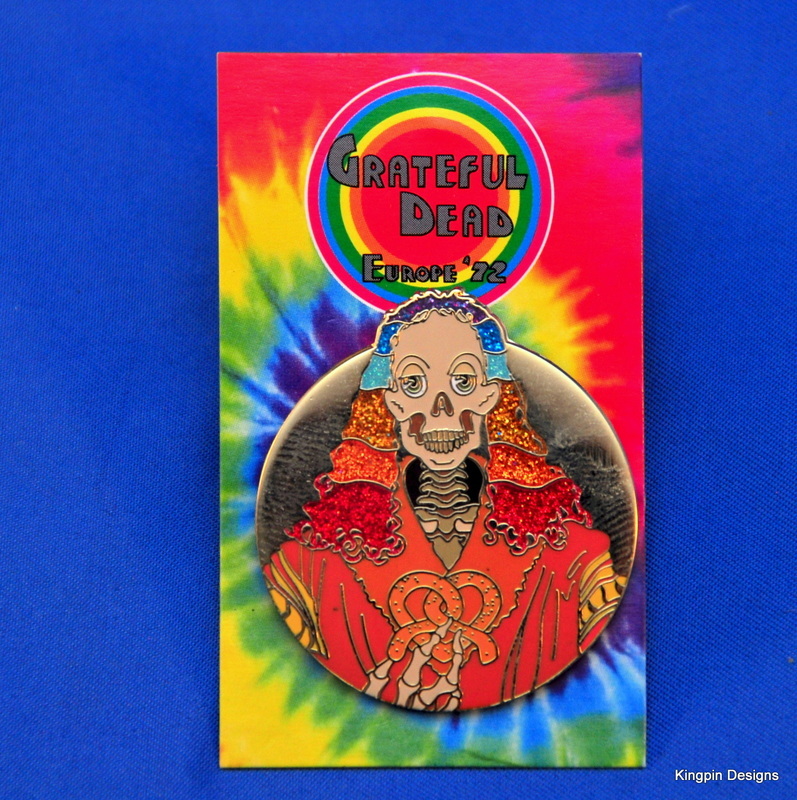 Kingpin Designs is extremely proud to announce the beginning of an all new collectors set of pins, the first since being officially licensed by Grateful Dead Productions to produce pins under their guidance and authority. This pin set will commemorate each of the 22 legendary shows from the 1972 European tour, featuring the artwork released by the band with the Europe '72: The Complete Recordings Boxed set, including the artwork from the original triple live album released in Nov 1972. 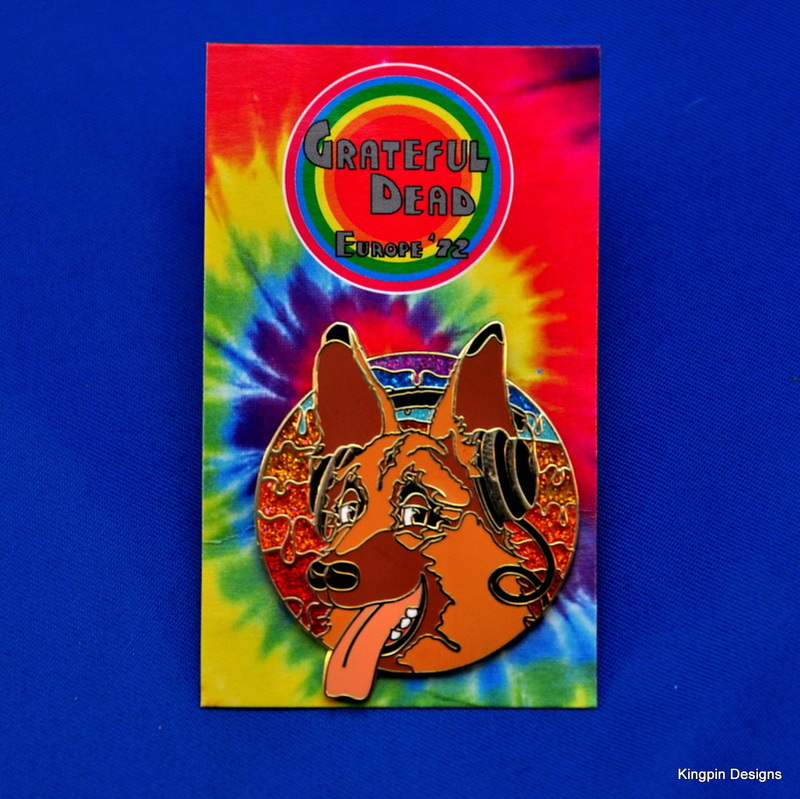 The first pin is the iconic artwork from the front cover of the original album, and each successive pin will feature the artwork from the boxed set for each show. There will be 24 total pins released in this set, with the final pin being the iconic Ice Cream Kid artwork from the back cover of the original album. 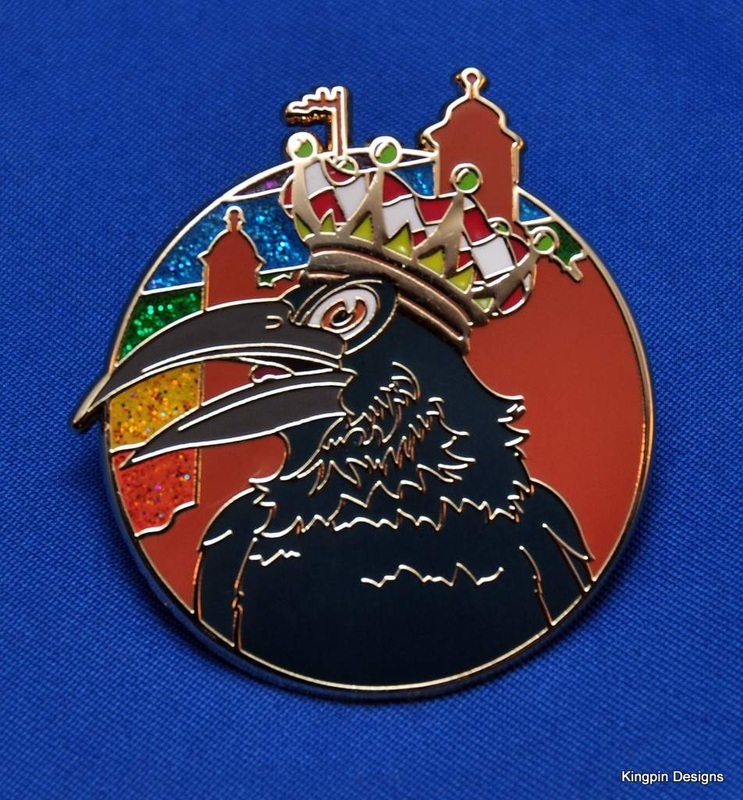 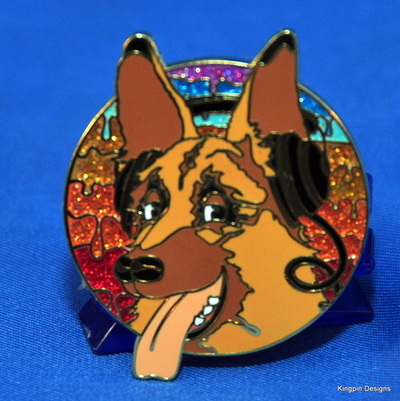 All pins are created in the highest quality hard enamel, featuring glitter, 3D molding, double posts and individual numbering, and are sold on a retail backing card which certifies their authenticity. 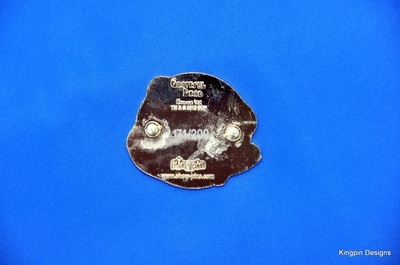 All pins are limited to an edition size of 200. 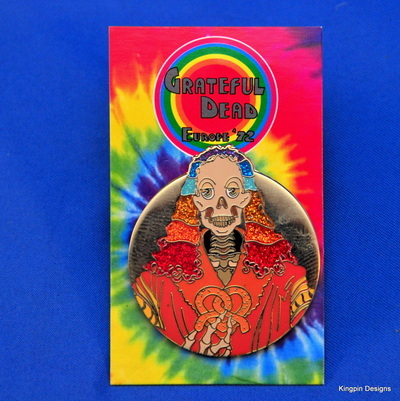 If you are looking for the full selection of Grateful Dead pins, visit the Grateful Dead Pins Page. 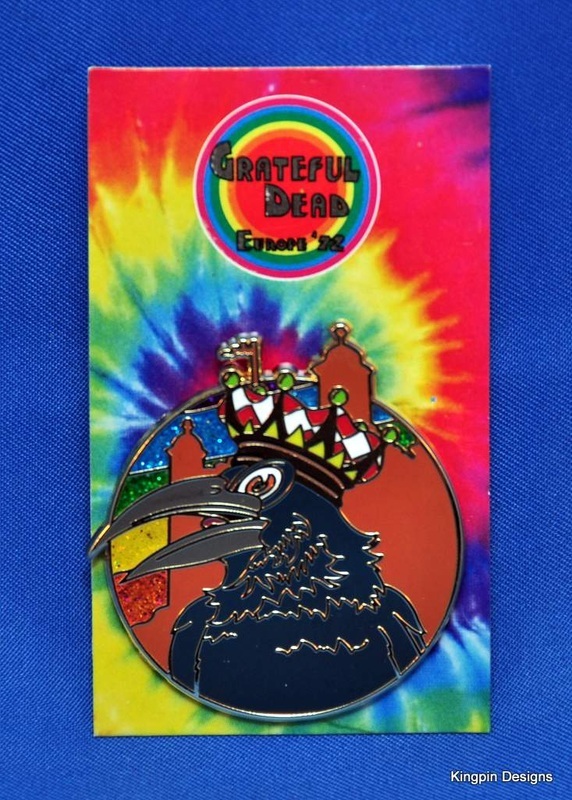 Complete 24 pin set. 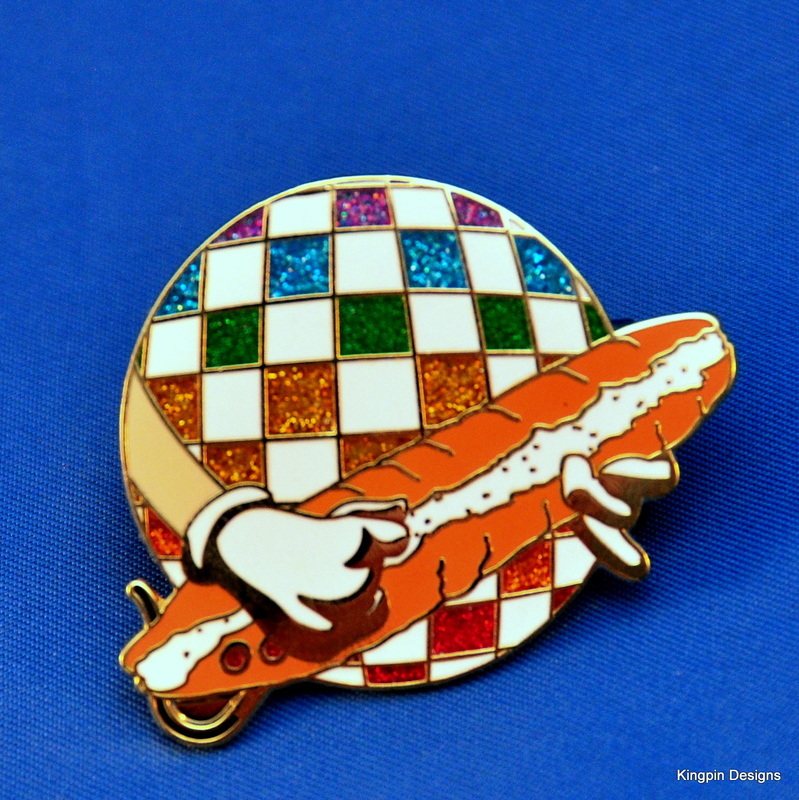 1 of each design is included. 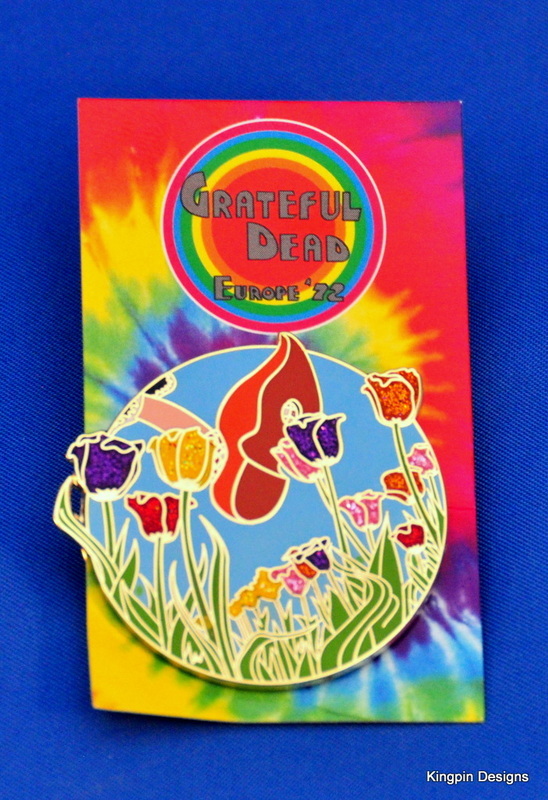 Optional matching numbered sets available. 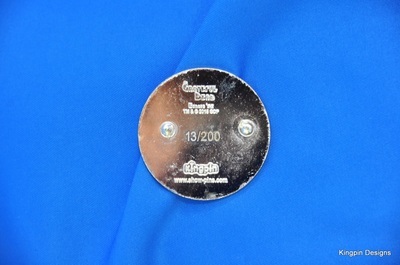 Purchase a full matching numbers set, but pay by the month! 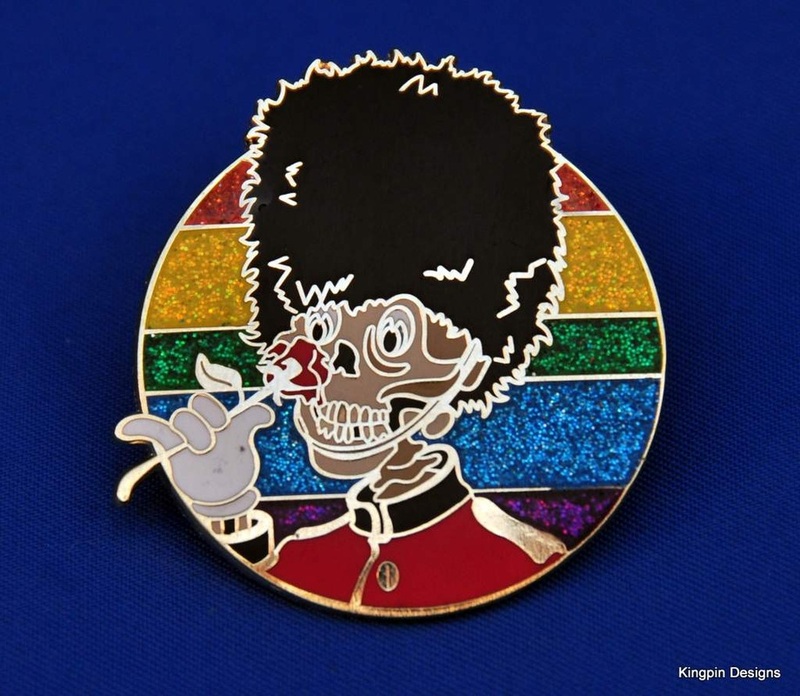 $40 for the first payment and $20 a month gets you a new pin a month for 2 years (pins will ship on a monthly basis, 2 pins the first month and 1 per month after the first month until the subscription is complete)! 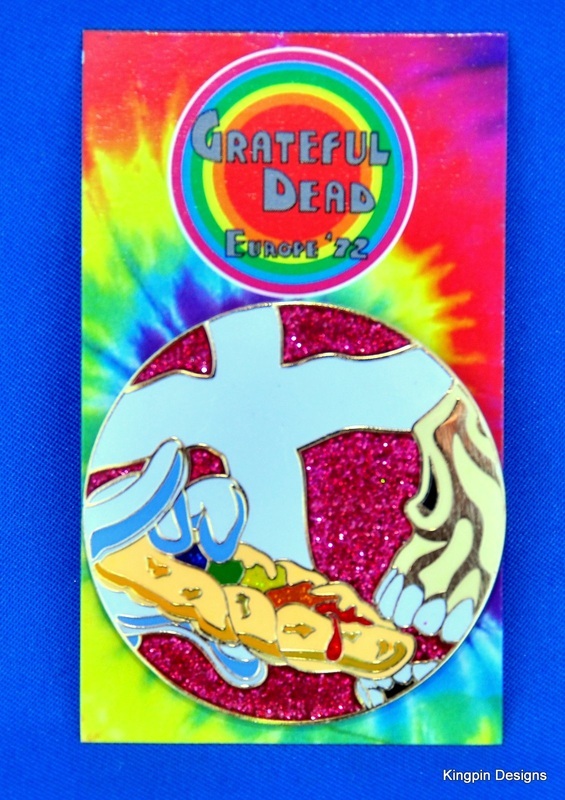 You can cancel the subscription at any time using the unsubscribe button below. 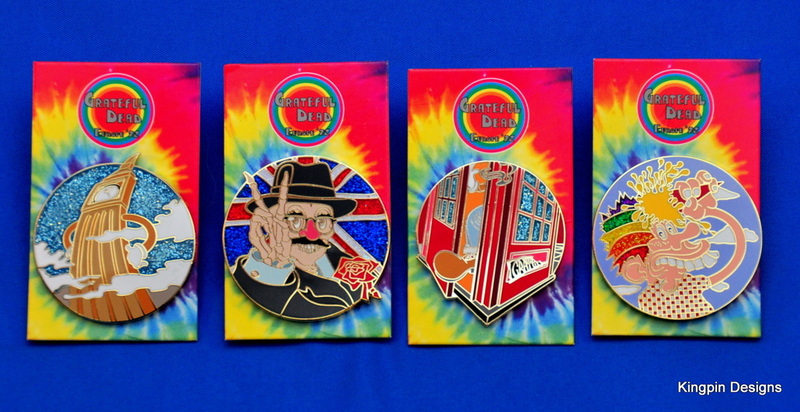 Complete sets of Series 1 pins can be purchased below. 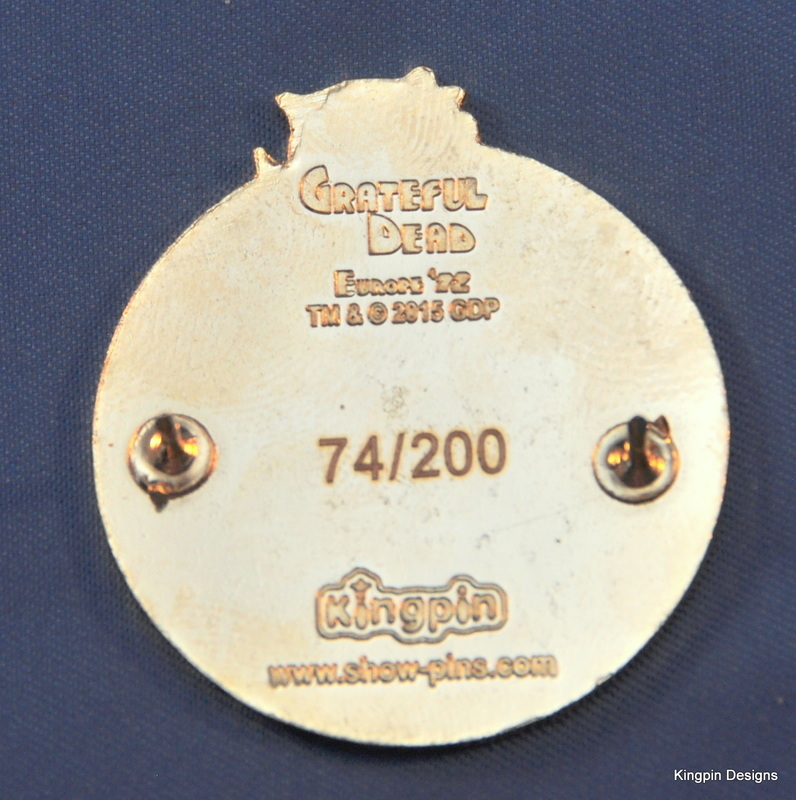 There is a limited number of matching numbered pin sets available, in which all 4 pins will be stamped with matching numbers. 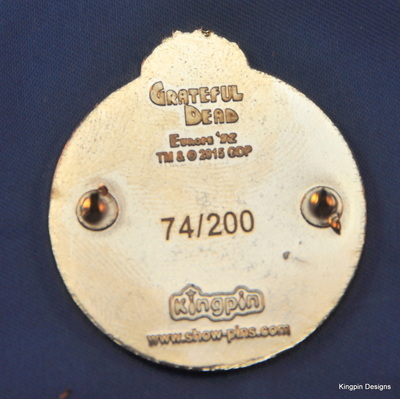 Non-Matching numbered sets will be all 4 pins, but the numbers stamped on the back are not guaranteed to match. 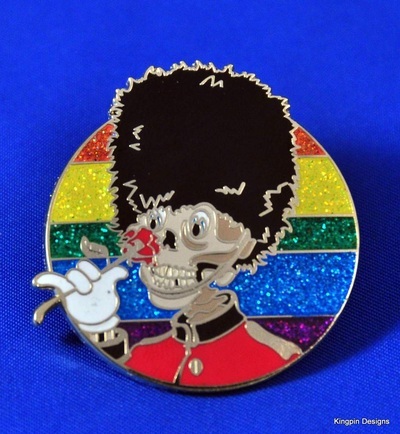 Continue scrolling down to purchase individual pins. 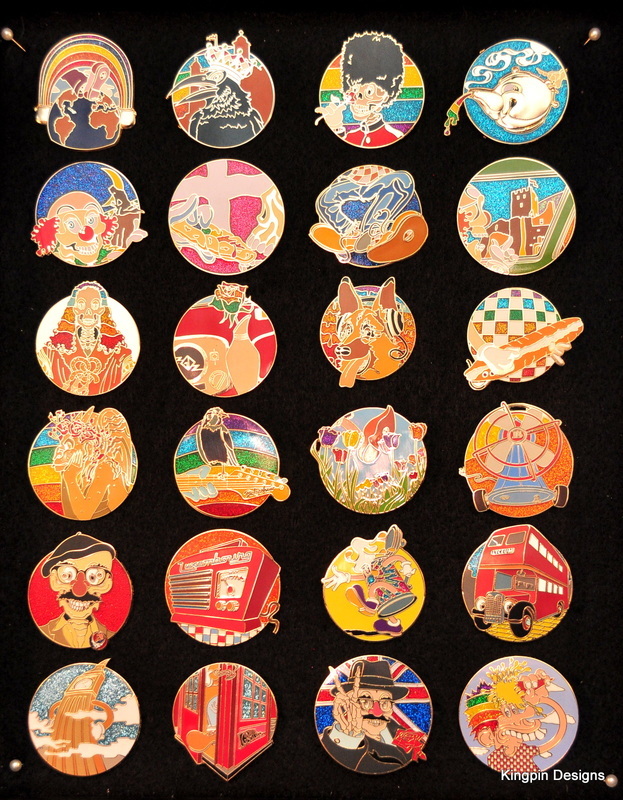 Complete sets of Series 2 pins can be purchased below. 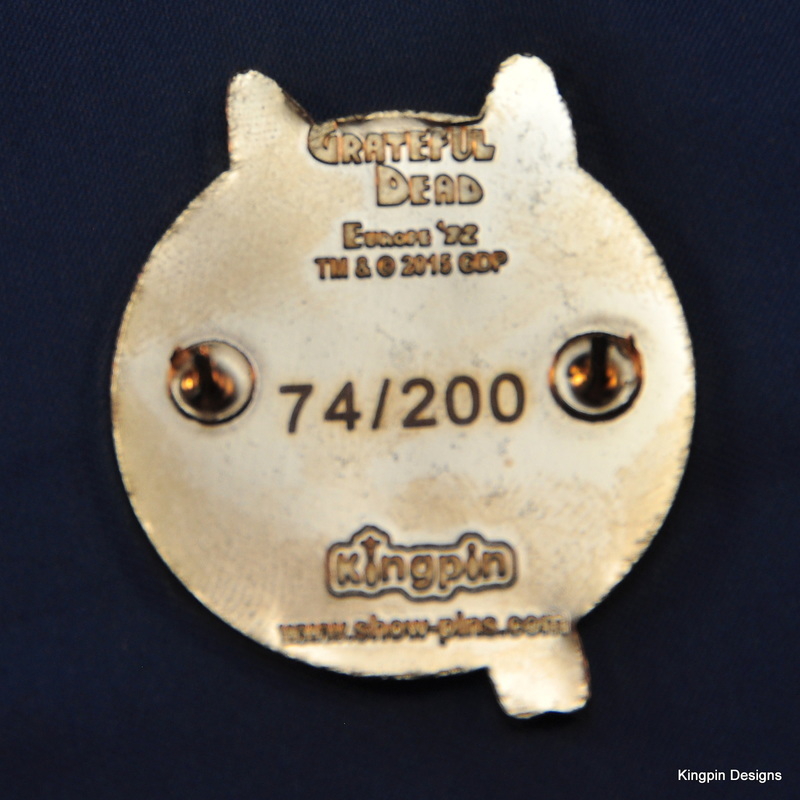 There is a limited number of matching numbered pin sets available, in which all 4 pins will be stamped with matching numbers. 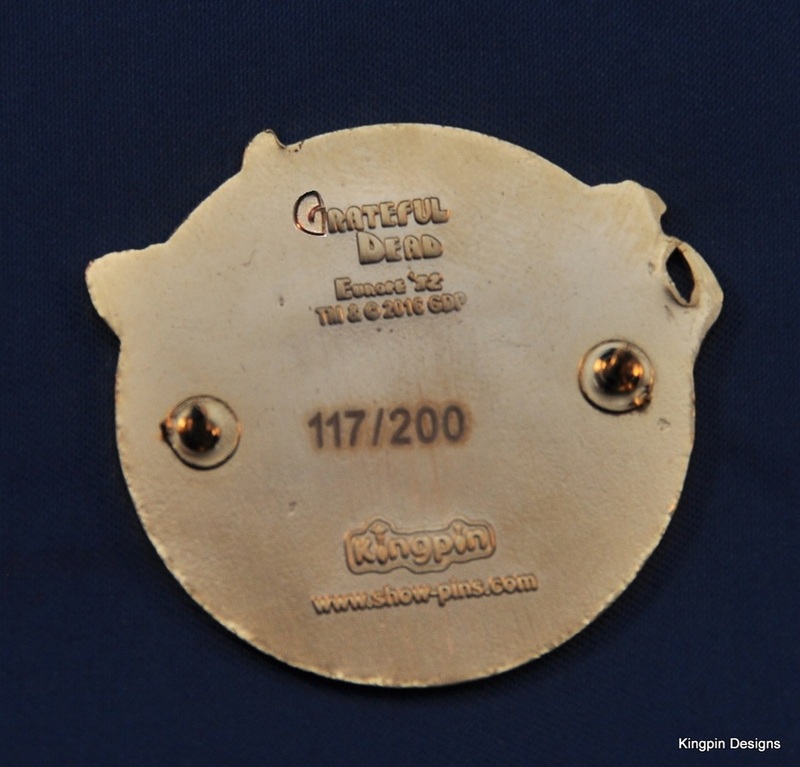 If you are adding to your existing set and would like to request a specific number, please use the contact form provided at checkout. 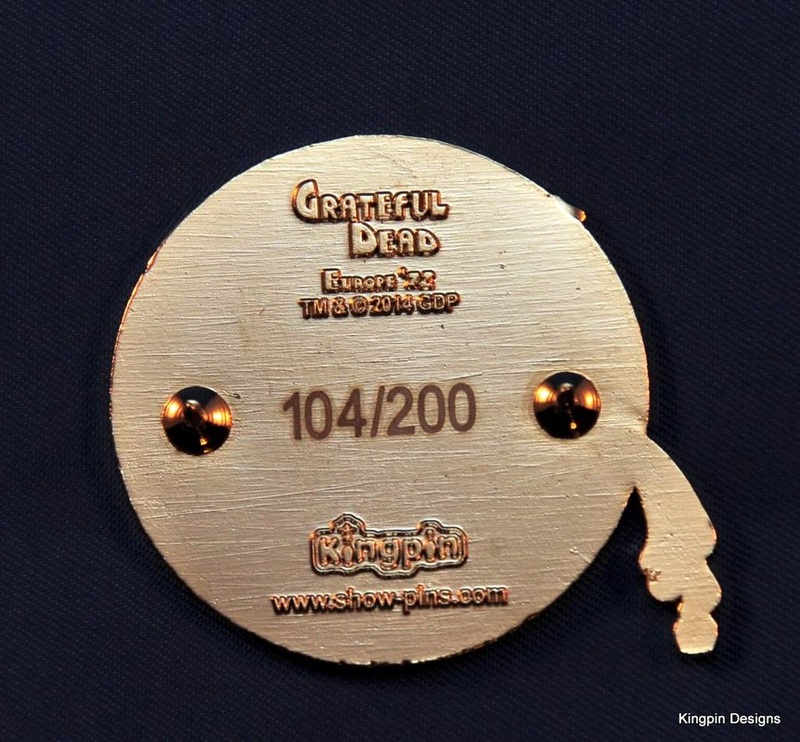 Non-Matching numbered sets will be all 4 pins, but the numbers stamped on the back are not guaranteed to match. 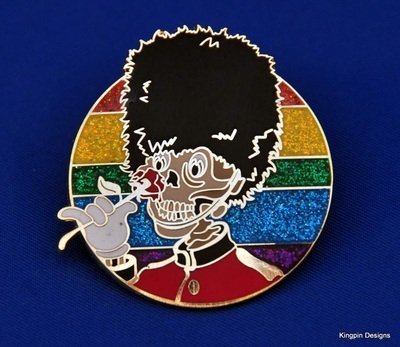 Continue scrolling down to purchase individual pins. 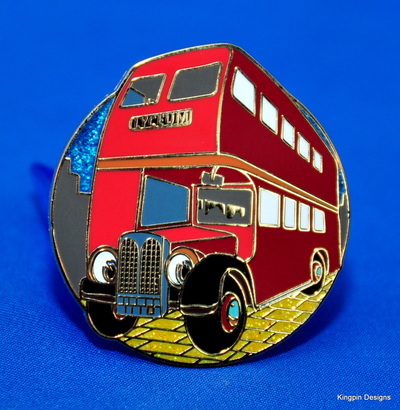 Complete sets of Series 3 pins can be purchased below. 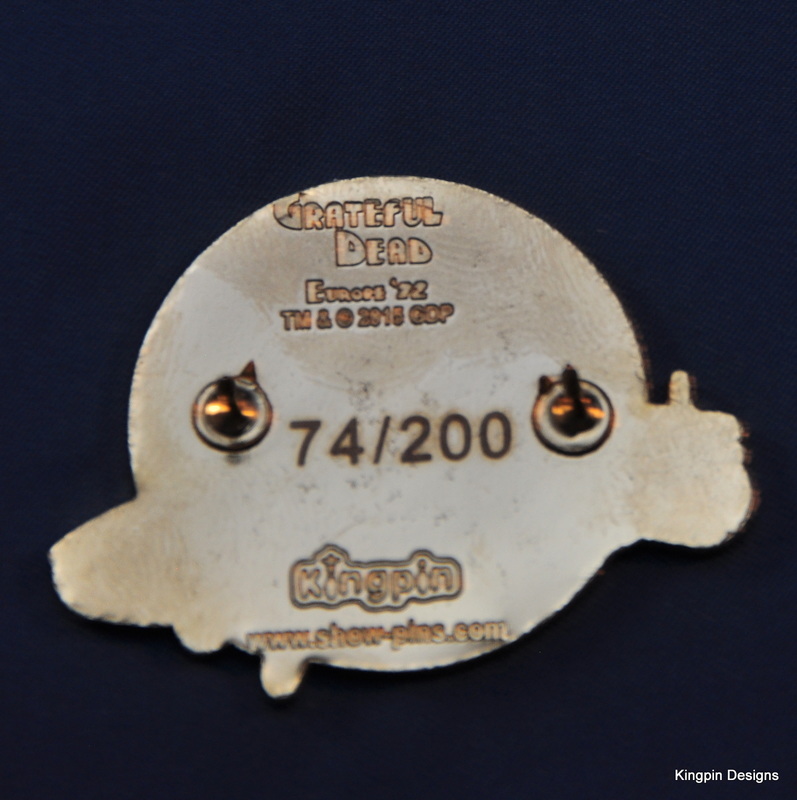 There is a limited number of matching numbered pin sets available, in which all 4 pins will be stamped with matching numbers. If you are adding to your existing set and would like to request a specific number, please use the contact form provided at checkout. 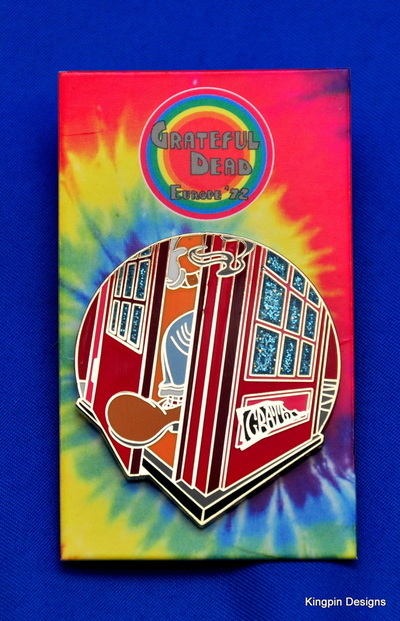 Complete sets of Series 4 pins can be purchased below. 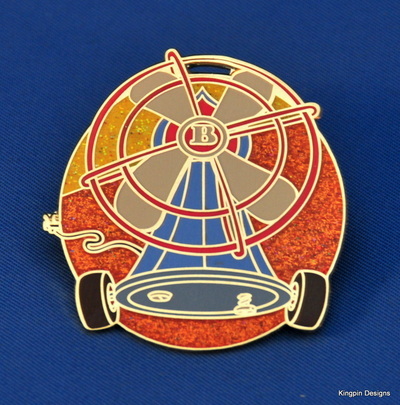 There is a limited number of matching numbered pin sets available, in which all 4 pins will be stamped with matching numbers. 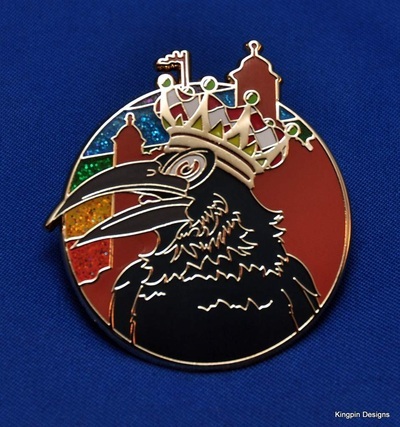 If you are adding to your existing set and would like to request a specific number, please use the contact form provided at checkout. 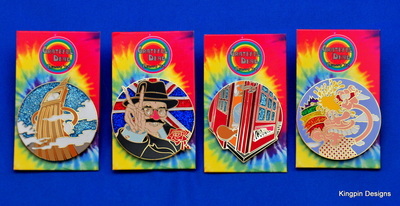 Complete sets of Series 5 pins can be purchased below. 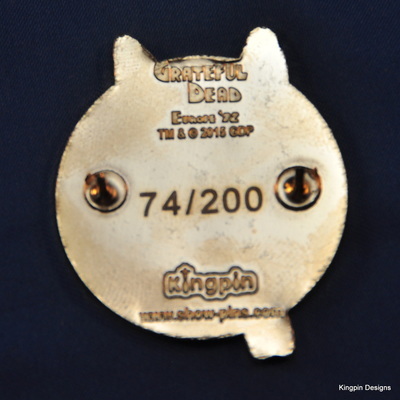 There is a limited number of matching numbered pin sets available, in which all 4 pins will be stamped with matching numbers. 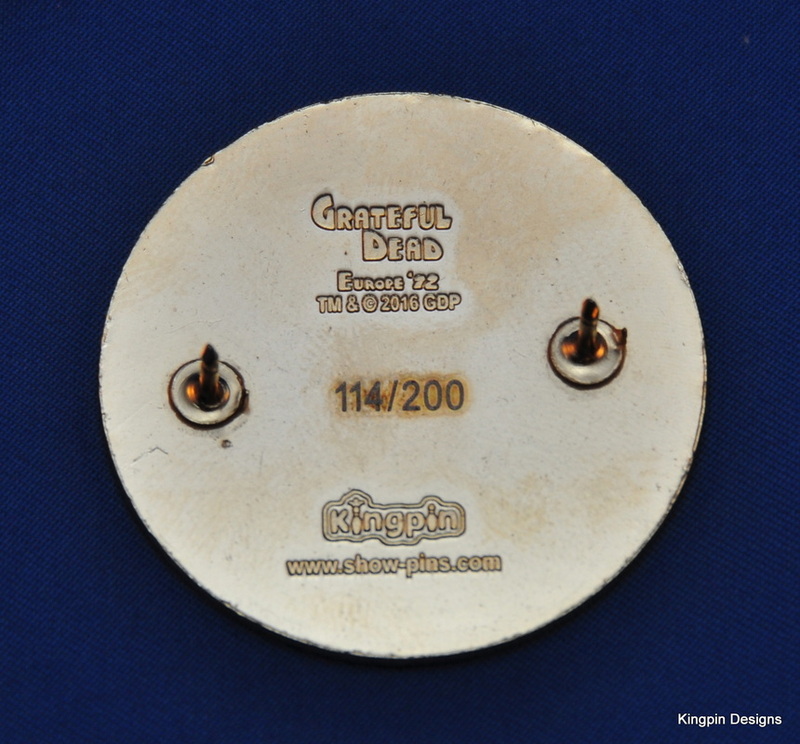 If you are adding to your existing set and would like to request a specific number, please use the contact form provided at checkout. 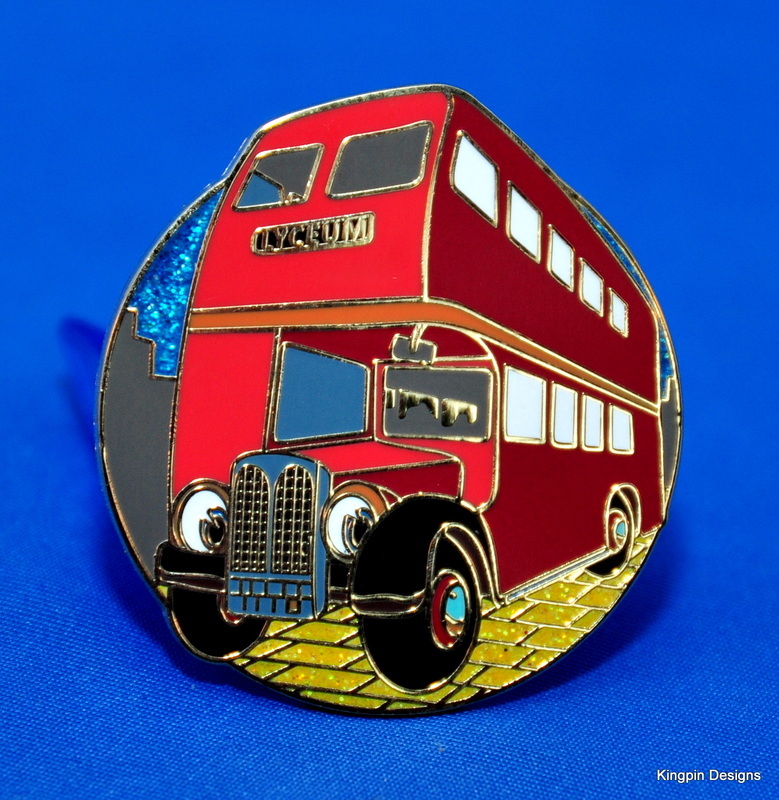 Complete sets of Series 6 pins can be purchased below. There is a limited number of matching numbered pin sets available, in which all 4 pins will be stamped with matching numbers. If you are adding to your existing set and would like to request a specific number, please use the contact form provided at checkout. 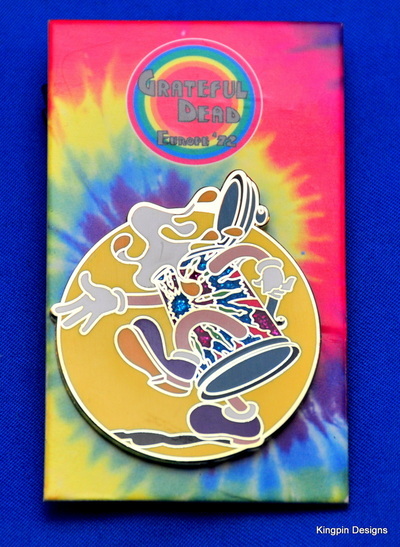 Pin #1 of the Europe '72 series features the original Kelly/Mouse album artwork from front of the legendary 1972 triple live album released on Nov 5th, 1972. 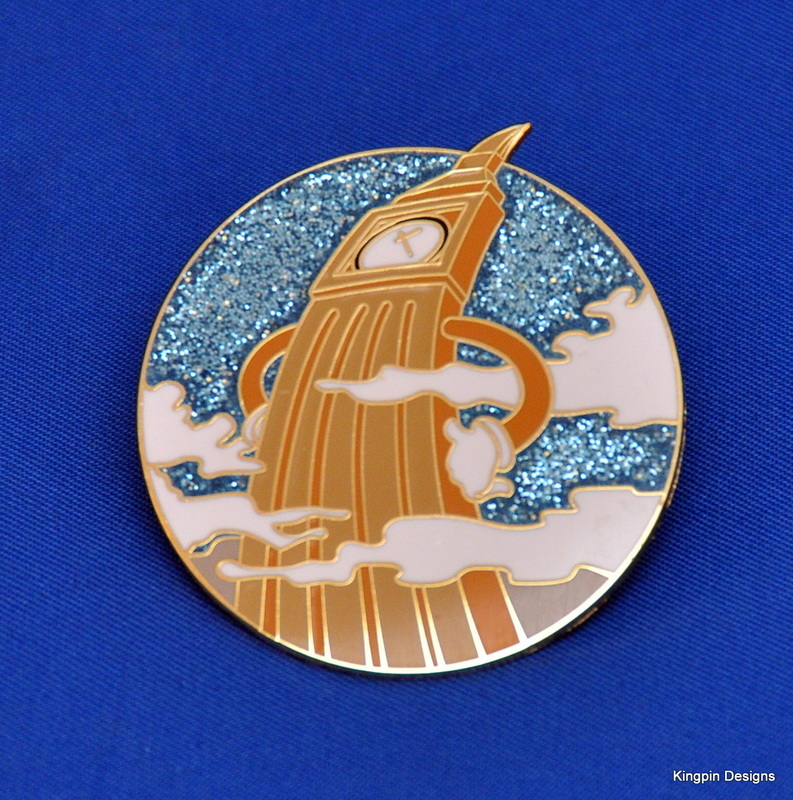 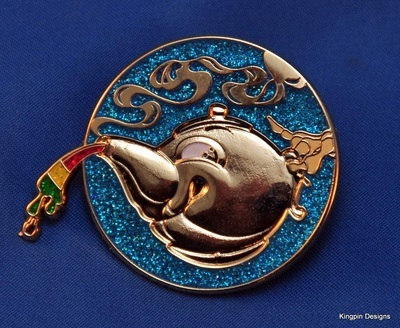 This pin has 3D molding for the gold pots at the end of the glitter rainbows, and it is 1.5 inches tall hard enamel finished in polished gold. 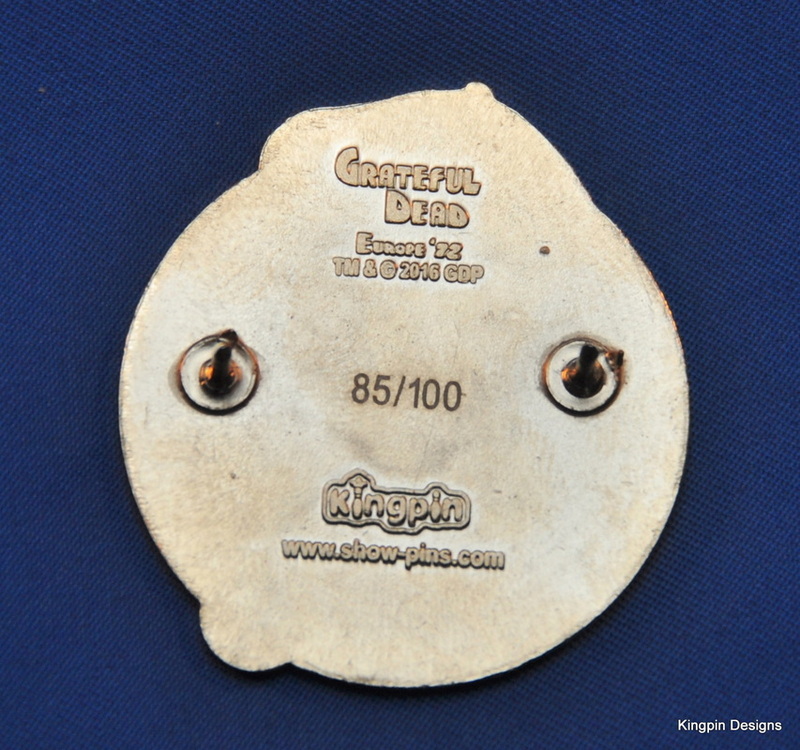 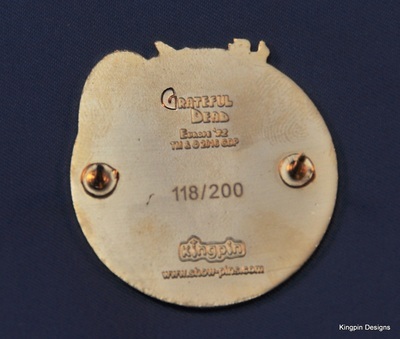 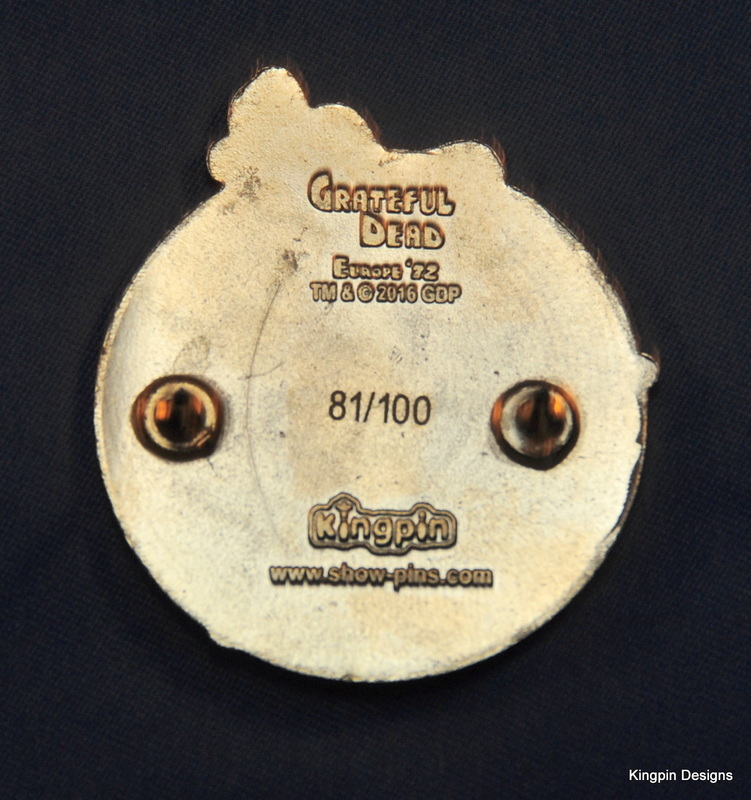 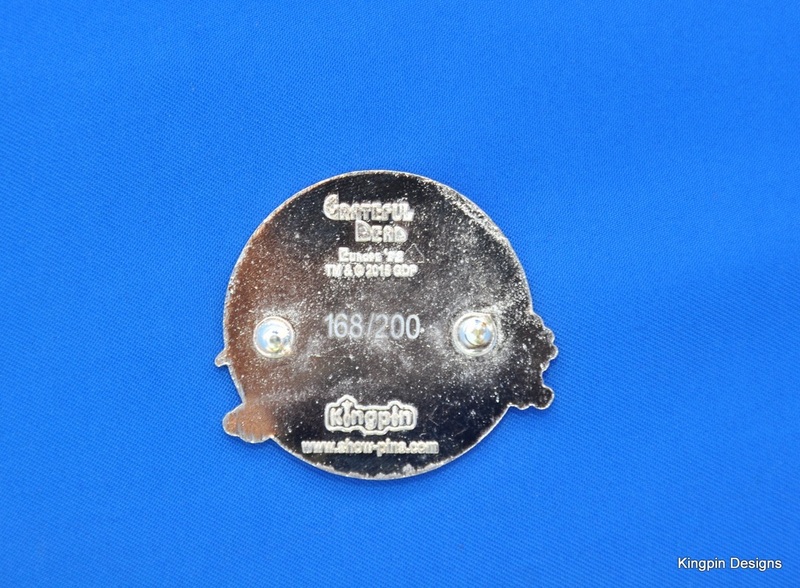 It is stamped on the back with the GDP trademark 2014, the Europe '72 Pin Set logo, and the Kingpin Designs logo. 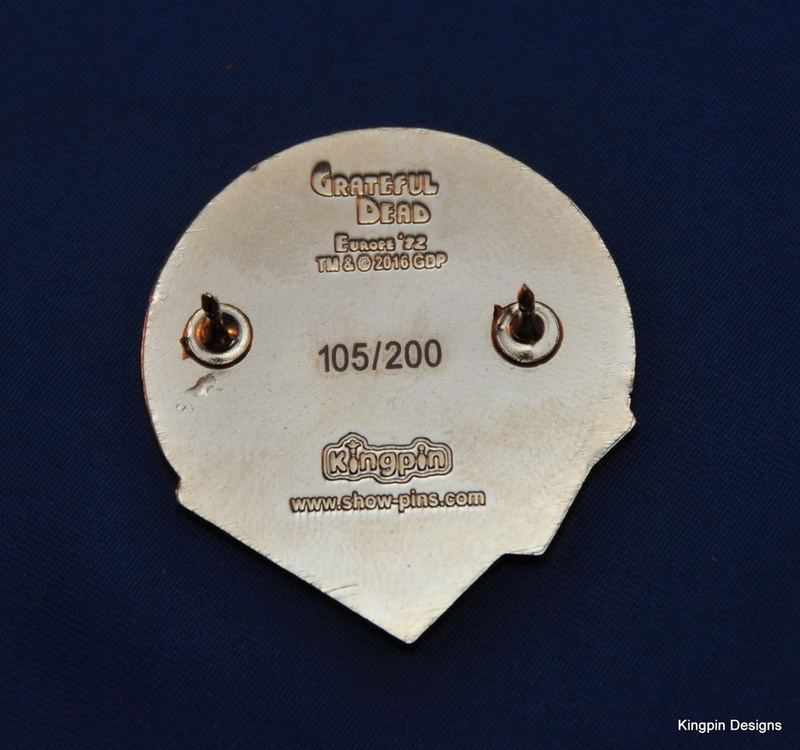 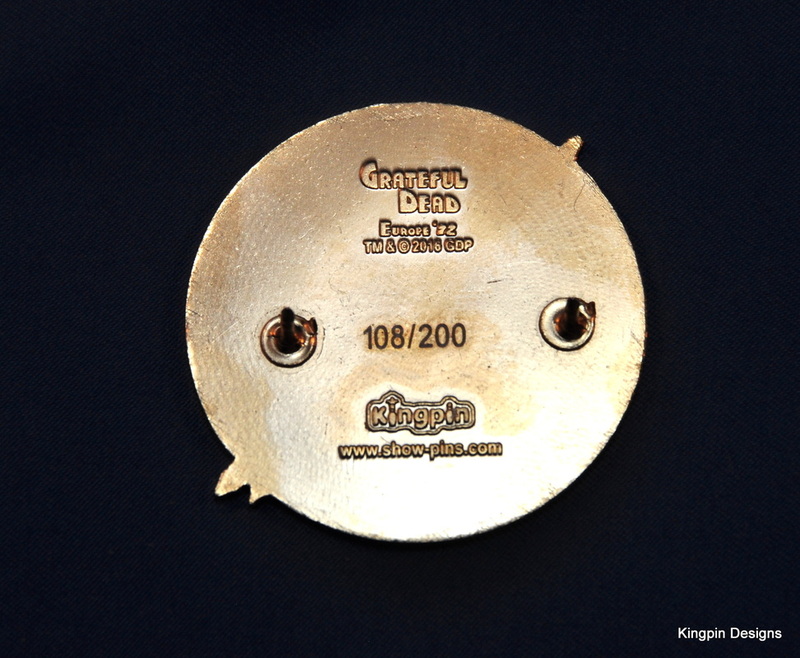 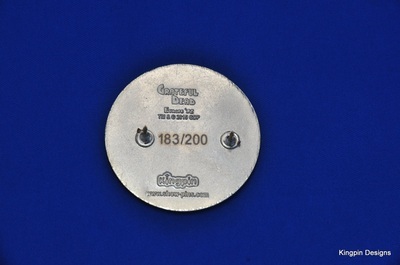 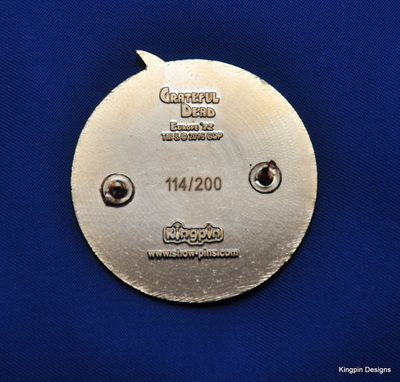 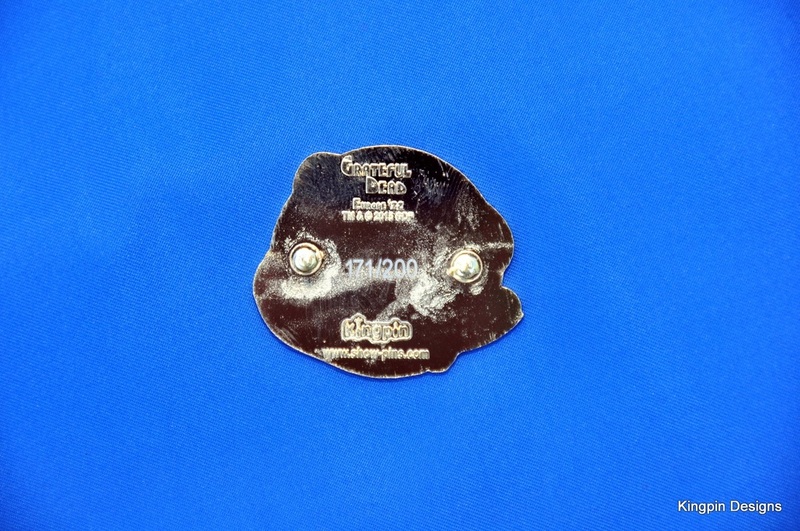 Each pin is individually numbered out of 200. Pin #2 of the Europe '72 series features the artwork from the Complete Recordings Boxed Set for the first night of the tour, Wembley Empire Pool, night 1, 4//7/72 (follow the link for more info or to purchase a recording of the show). 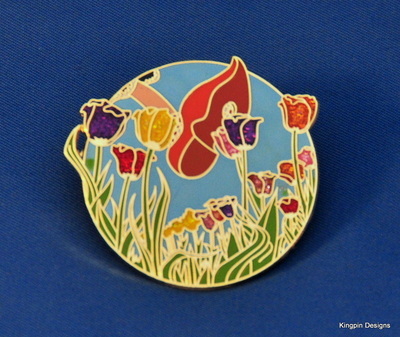 This pin is 1.5 inches tall hard enamel finished in polished gold. 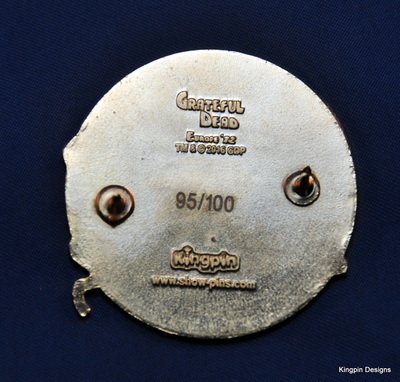 It is stamped on the back with the GDP trademark 2014, the Europe '72 Pin Set logo, and the Kingpin Designs logo. Each pin is individually numbered out of 200. Pin #3 of the Europe '72 series features the artwork from the Complete Recordings Boxed Set for the second night of the tour, Wembley Empire Pool, night 2, 4//8/72 (follow the link for more info or to purchase a recording of the show). This pin is 1.5 inches tall hard enamel finished in polished gold. 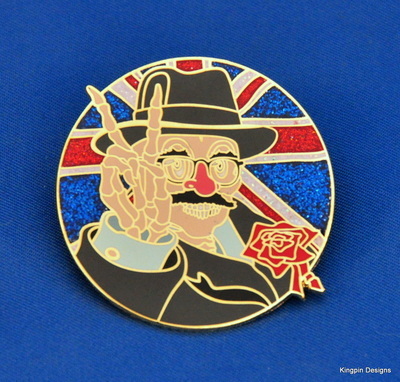 It is stamped on the back with the GDP trademark 2014, the Europe '72 Pin Set logo, and the Kingpin Designs logo. Each pin is individually numbered out of 200. The reflections this pin creates makes it difficult to capture in photos, so see the images below for additional views in different light. 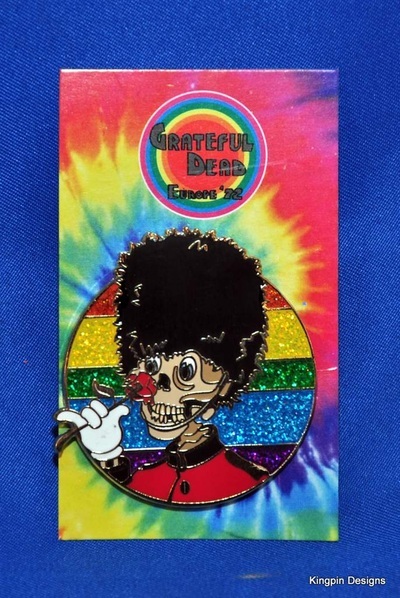 Pin #4 of the Europe '72 series features the artwork from the Complete Recordings Boxed Set for the third night of the tour, Newcastle City Hall, 4/11/72 (follow the link for more info or to purchase a recording of the show). 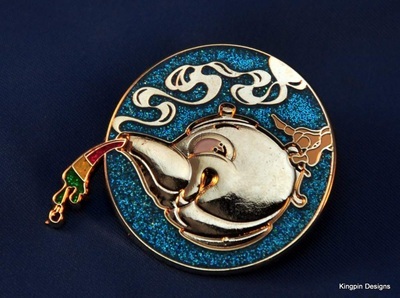 This pin features a large 3D mold of the teapot in the center and is 1.5 inches tall hard enamel finished in polished gold. 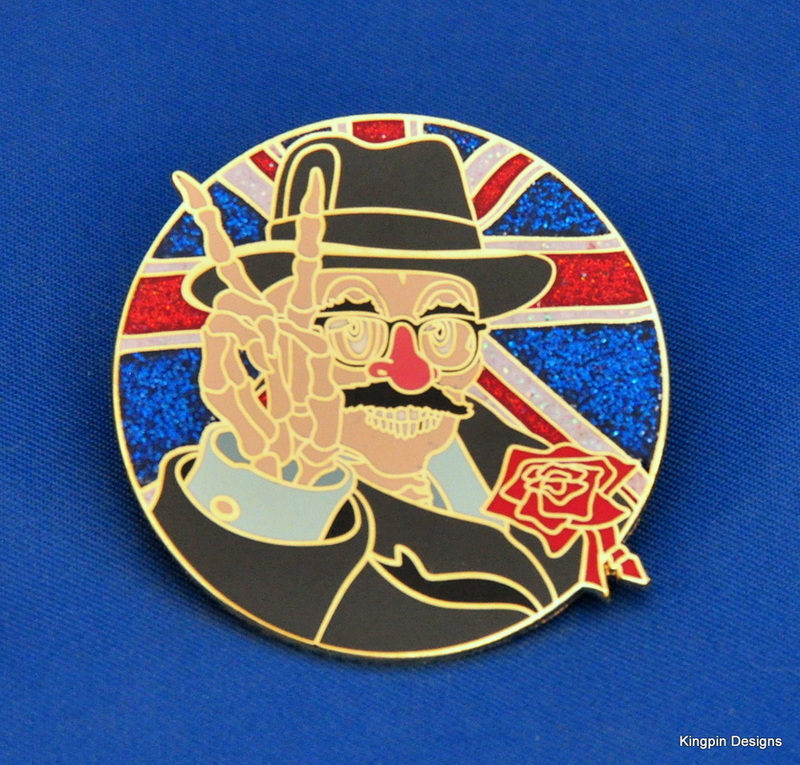 It is stamped on the back with the GDP trademark 2014, the Europe '72 Pin Set logo, and the Kingpin Designs logo. 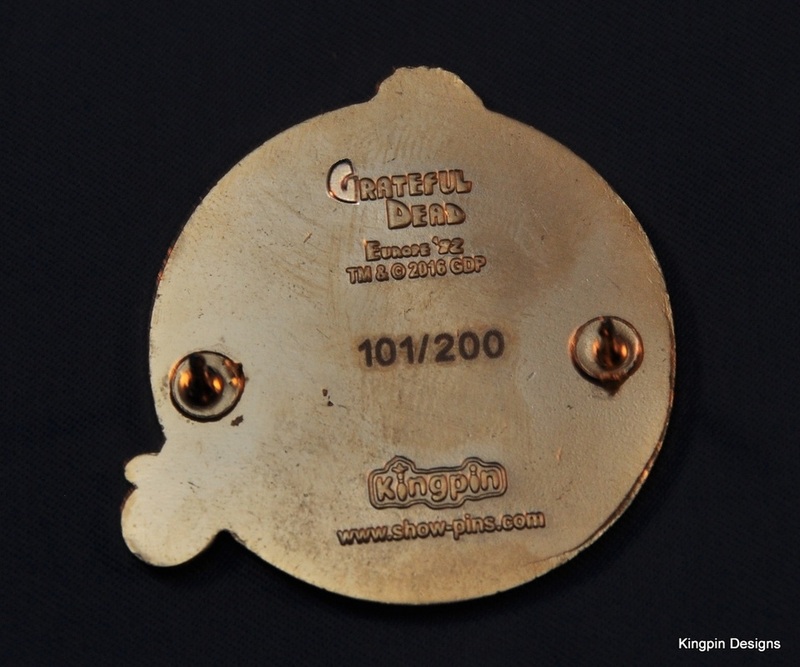 Each pin is individually numbered out of 200. 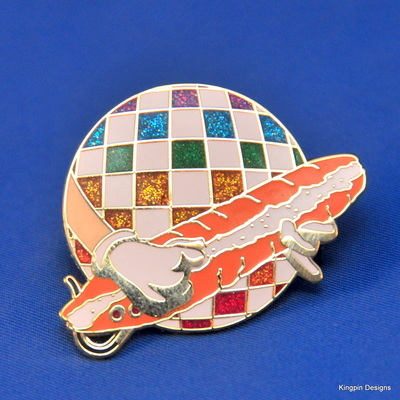 The reflections this pin creates makes it difficult to capture in photos, so see the images below for additional views in different light. Pin #5 of the Europe '72 series features the artwork from the Complete Recordings Boxed Set for the fourth night of the tour, Tivoli Concert Hall (follow the link for more info or to purchase a recording of the show). 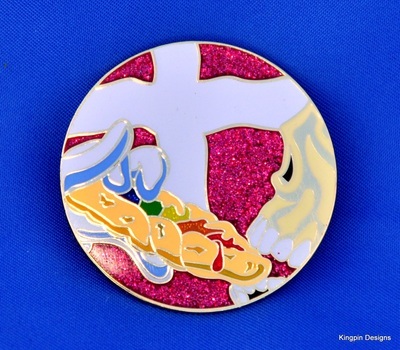 This pin is 1.5 inches tall hard enamel finished in polished gold. 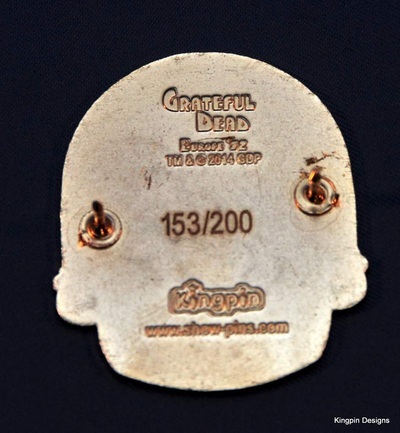 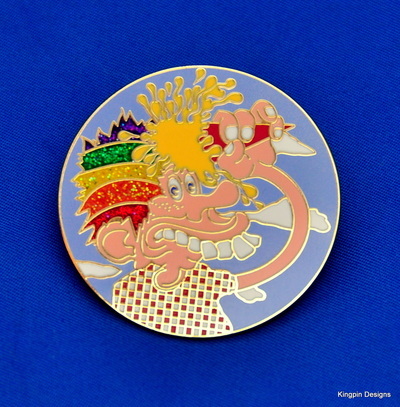 It is stamped on the back with the GDP trademark 2015, the Europe '72 Pin Set logo, and the Kingpin Designs logo. Each pin is individually numbered out of 200.The reflections this pin creates makes it difficult to capture in photos, so see the images below for additional views in different light. 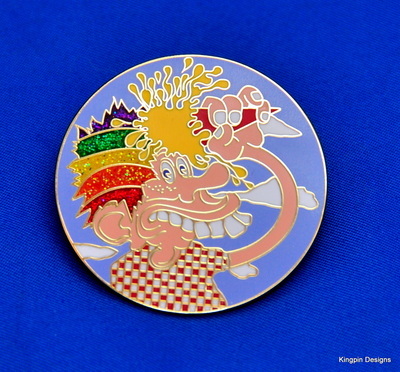 Pin #6 of the Europe '72 series features the artwork from the Complete Recordings Boxed Set for the fifth night of the tour, Aarhus University Show (follow the link for more info or to purchase a recording of the show). This pin is 1.5 inches tall hard enamel finished in polished gold. It is stamped on the back with the GDP trademark 2015, the Europe '72 Pin Set logo, and the Kingpin Designs logo. 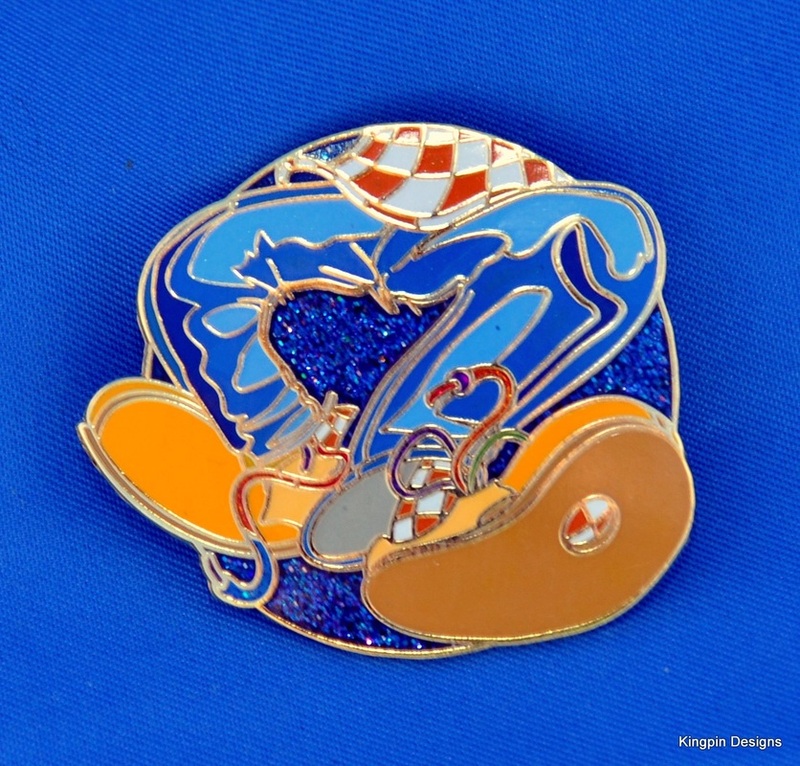 Each pin is individually numbered out of 200.The reflections this pin creates makes it difficult to capture in photos, so see the images below for additional views in different light. 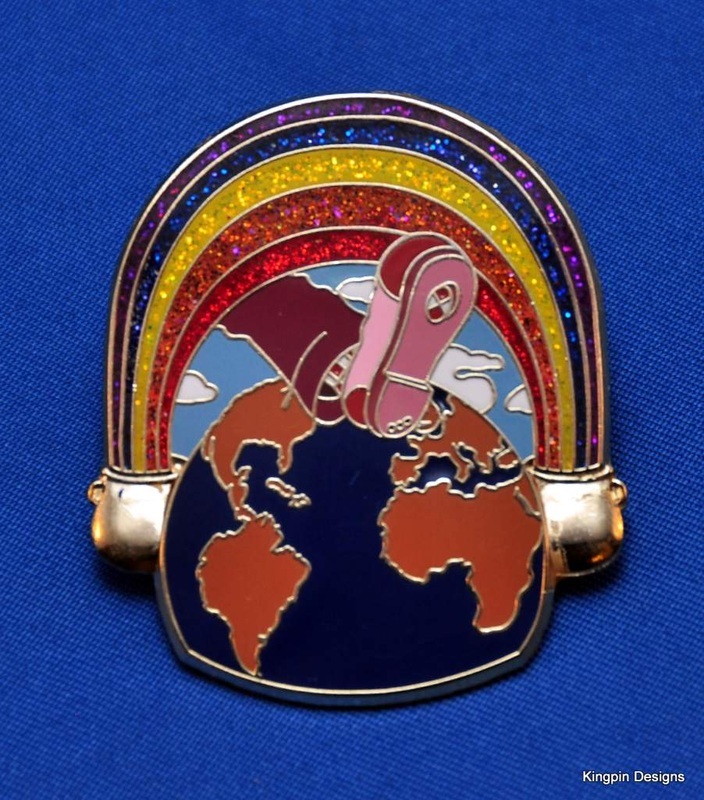 Pin #7 of the Europe '72 series features the artwork from the Complete Recordings Boxed Set for the sixth night of the tour, Tivoli Concert Hall (follow the link for more info or to purchase a recording of the show). This pin is 1.5 inches tall hard enamel finished in polished gold. 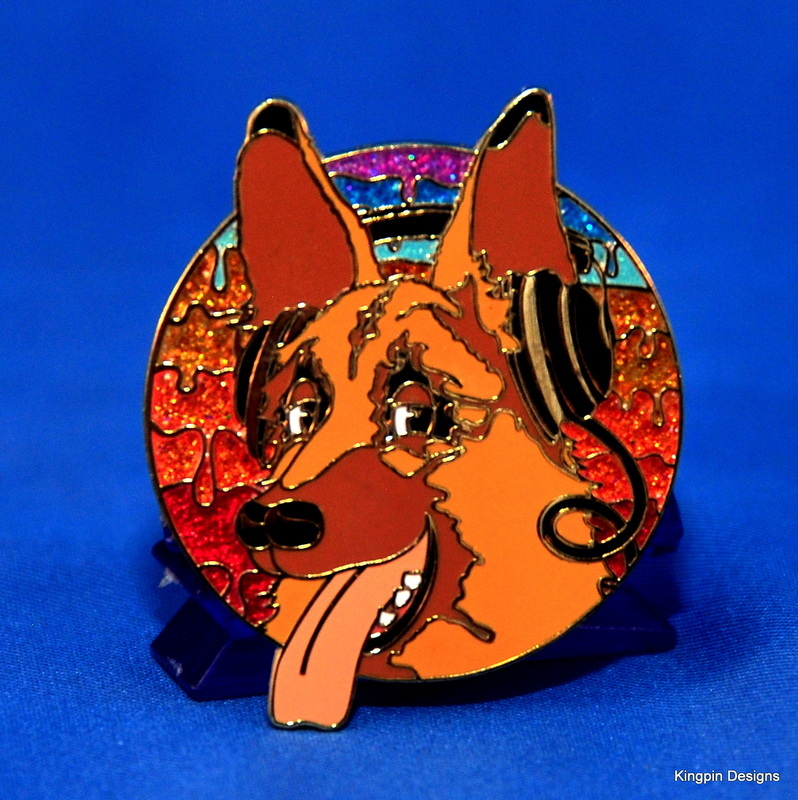 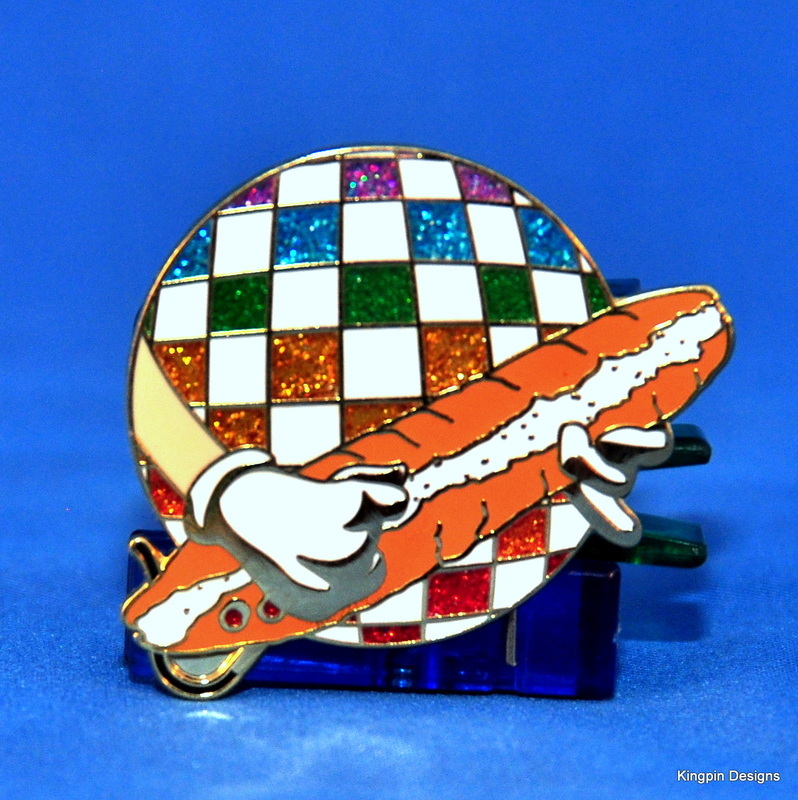 It is stamped on the back with the GDP trademark 2015, the Europe '72 Pin Set logo, and the Kingpin Designs logo. 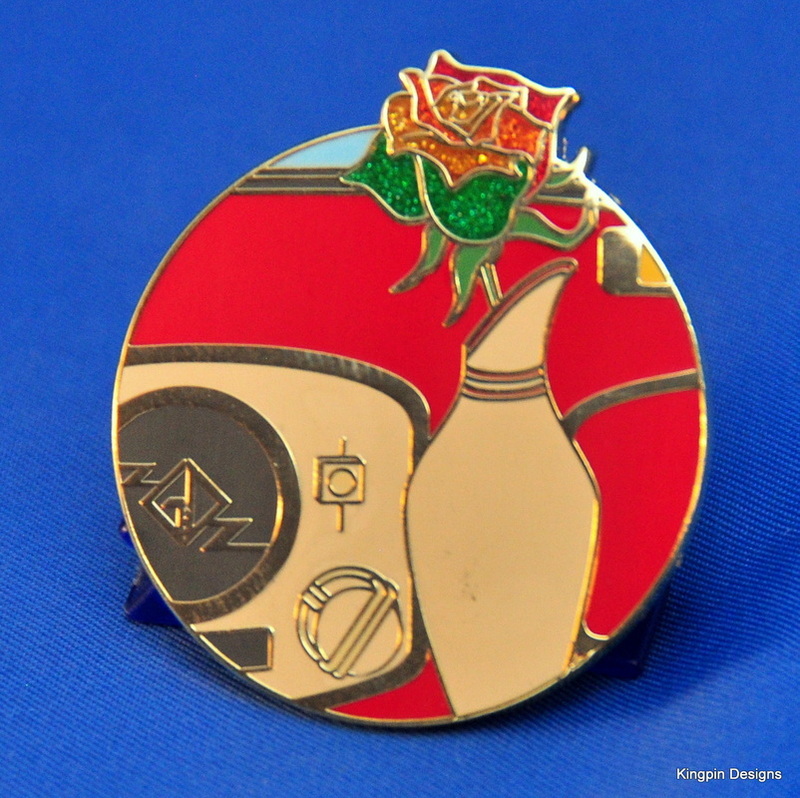 Each pin is individually numbered out of 200.The reflections this pin creates makes it difficult to capture in photos, so see the images below for additional views in different light. 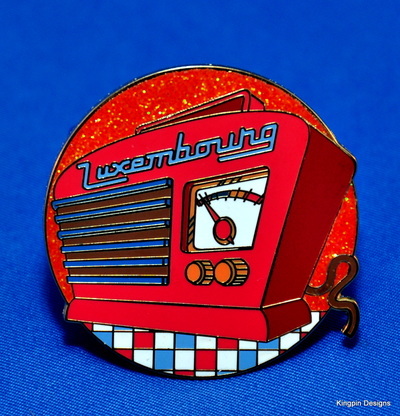 Pin #8 of the Europe '72 series features the artwork from the Complete Recordings Boxed Set for the seventh night of the tour, Bremen Beat Club (follow the link for more info or to purchase a recording of the show). 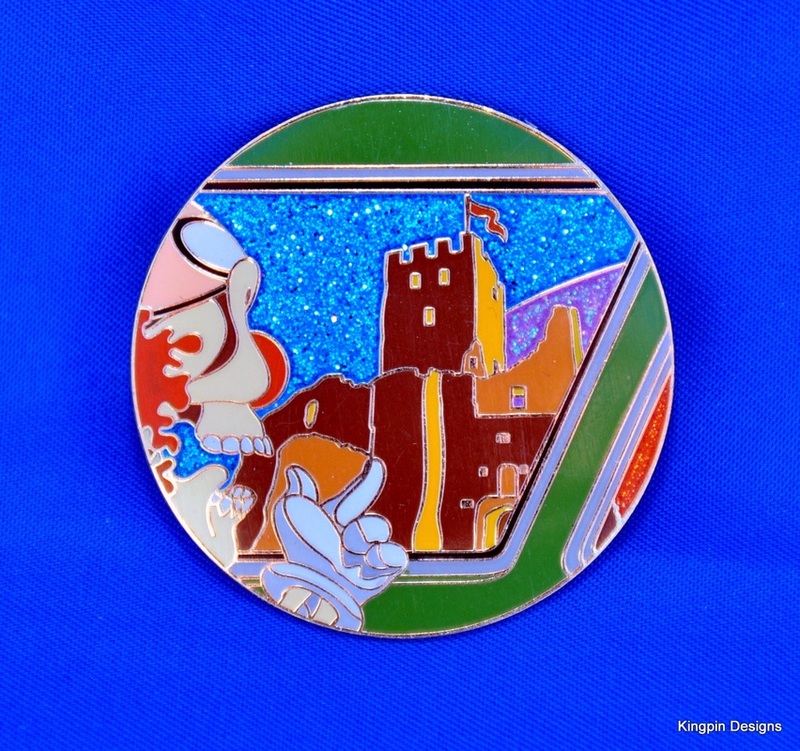 This pin is 1.5 inches tall hard enamel finished in polished gold. 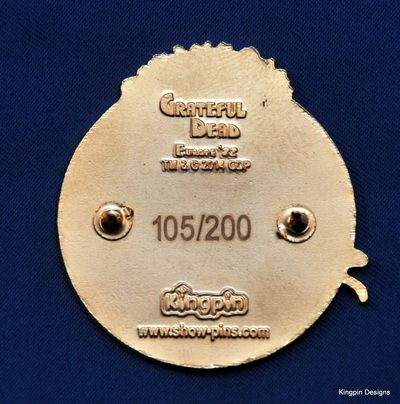 It is stamped on the back with the GDP trademark 2015, the Europe '72 Pin Set logo, and the Kingpin Designs logo. 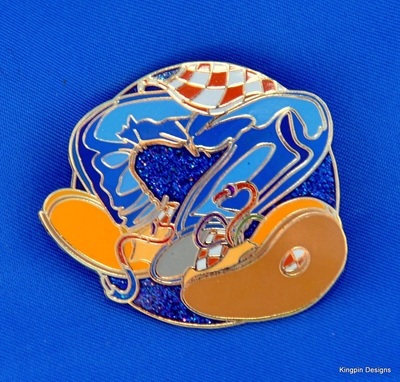 Each pin is individually numbered out of 200.The reflections this pin creates makes it difficult to capture in photos, so see the images below for additional views in different light. 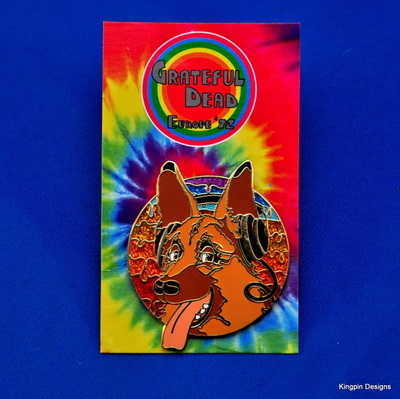 Pin #9 of the Europe '72 series features the artwork from the Complete Recordings Boxed Set for the eighth night of the tour, Rheinhalle, Dusseldorf (follow the link for more info or to purchase a recording of the show). 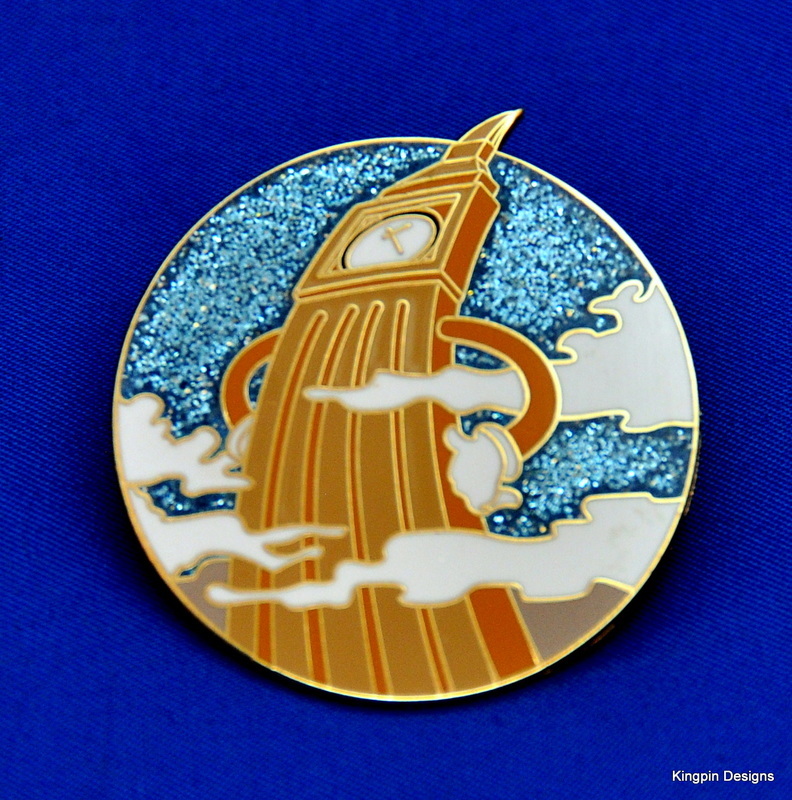 This pin is 1.5 inches tall hard enamel finished in polished gold. It is stamped on the back with the GDP trademark 2015, the Europe '72 Pin Set logo, and the Kingpin Designs logo. 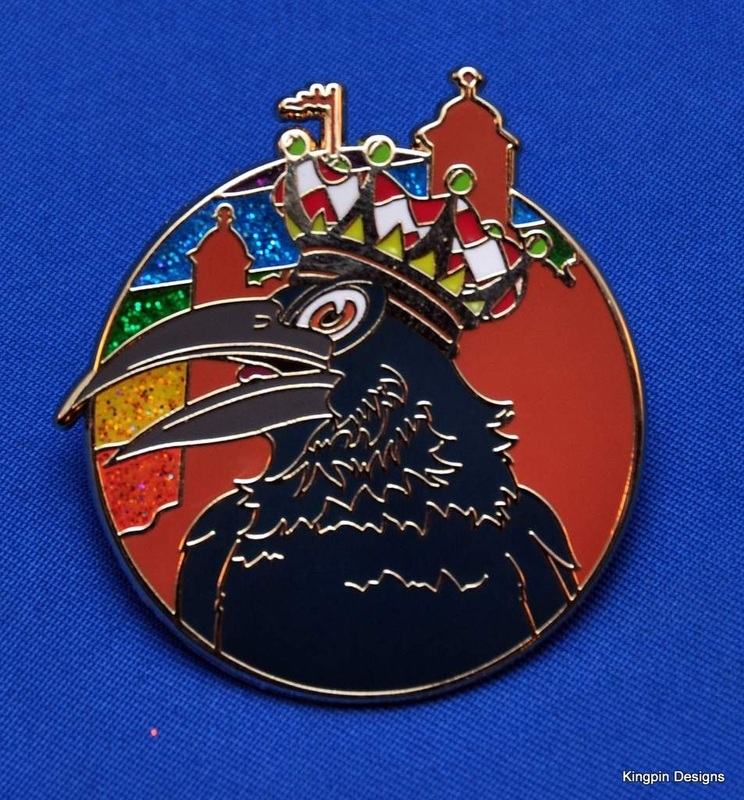 Each pin is individually numbered out of 200.The reflections this pin creates makes it difficult to capture in photos, so see the images below for additional views in different light. 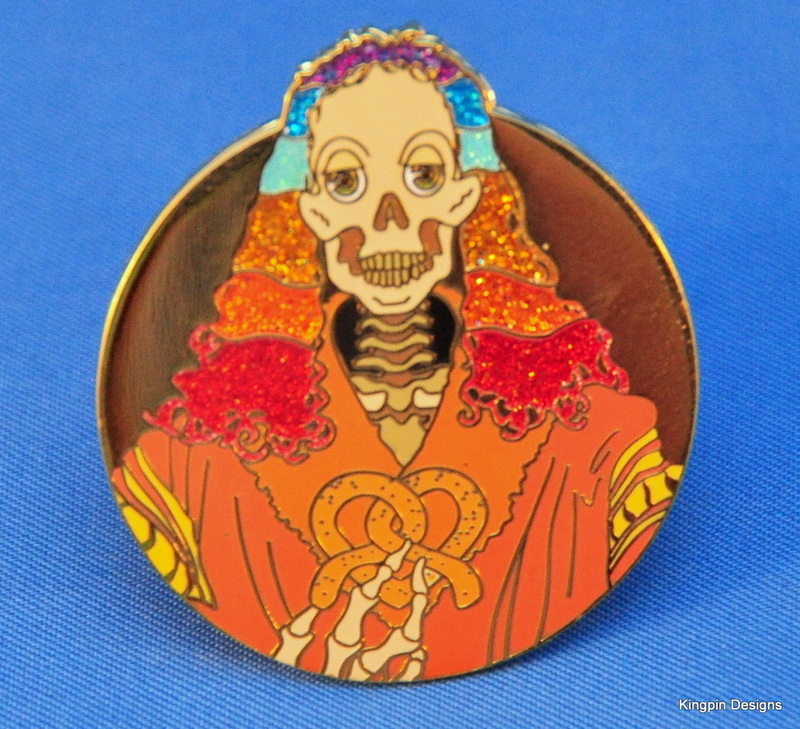 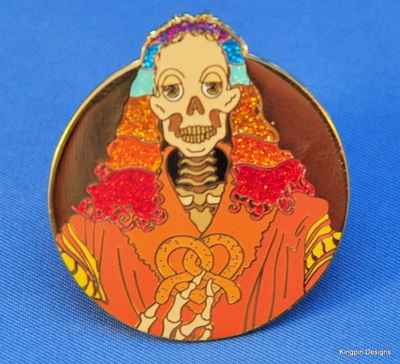 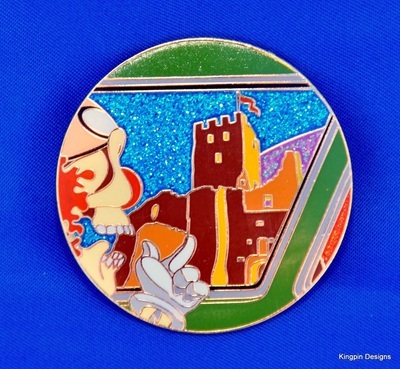 Pin #10 of the Europe '72 series features the artwork from the Complete Recordings Boxed Set for the ninth night of the tour, Jahrhundert Halle, Frankfurt (follow the link for more info or to purchase a recording of the show). 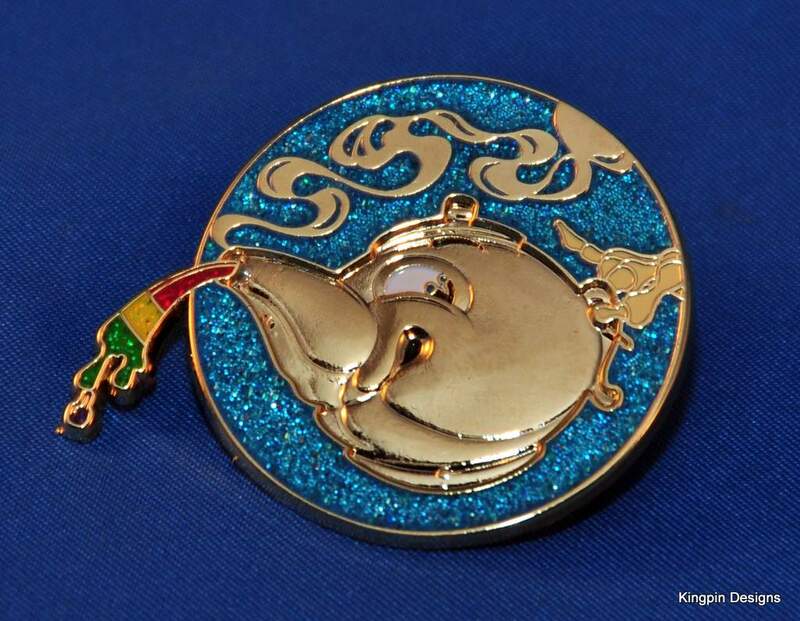 This pin is 1.5 inches tall hard enamel finished in polished gold. It is stamped on the back with the GDP trademark 2015, the Europe '72 Pin Set logo, and the Kingpin Designs logo. 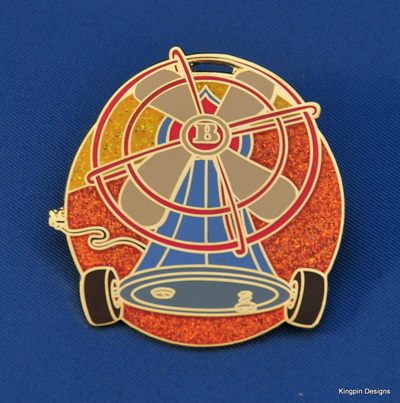 Each pin is individually numbered out of 200.The reflections this pin creates makes it difficult to capture in photos, so see the images below for additional views in different light. Pin #11 of the Europe '72 series features the artwork from the Complete Recordings Boxed Set for the tenth night of the tour, Musikhalle, Hamburg (follow the link for more info or to purchase a recording of the show). 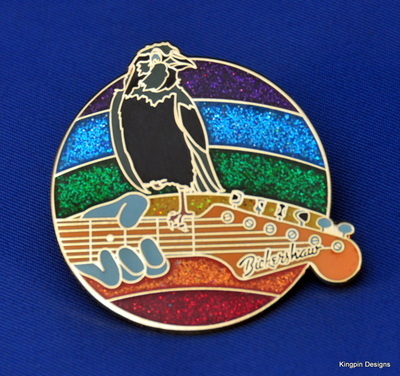 This pin is 1.5 inches tall hard enamel finished in polished gold. It is stamped on the back with the GDP trademark 2015, the Europe '72 Pin Set logo, and the Kingpin Designs logo. 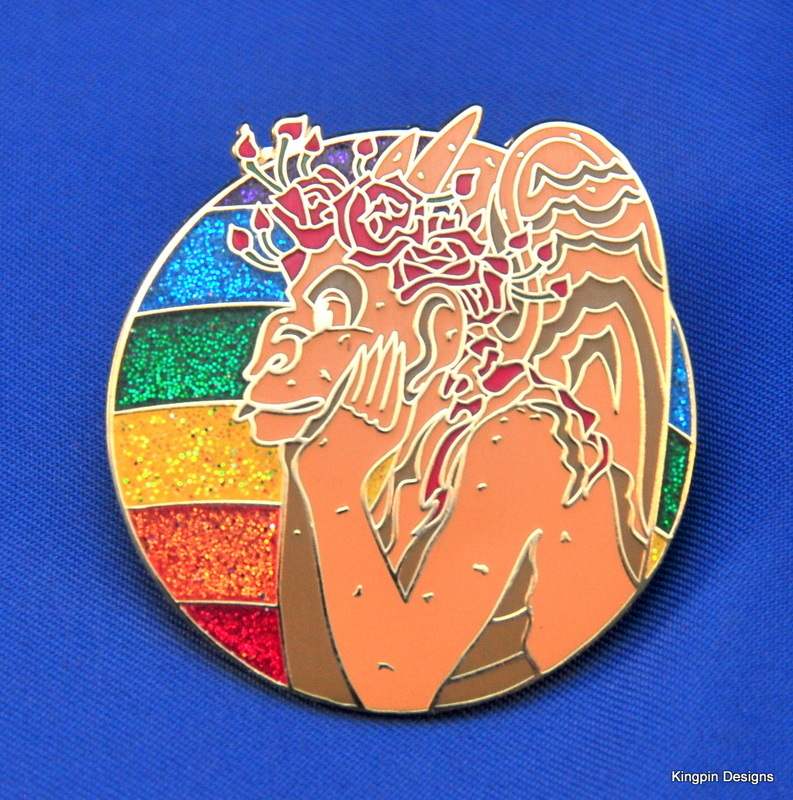 Each pin is individually numbered out of 200.The reflections this pin creates makes it difficult to capture in photos, so see the images below for additional views in different light. Pin #12 of the Europe '72 series features the artwork from the Complete Recordings Boxed Set for the eleventh night of the tour, L'Olympia, Paris 5/3/1972 (follow the link for more info or to purchase a recording of the show). 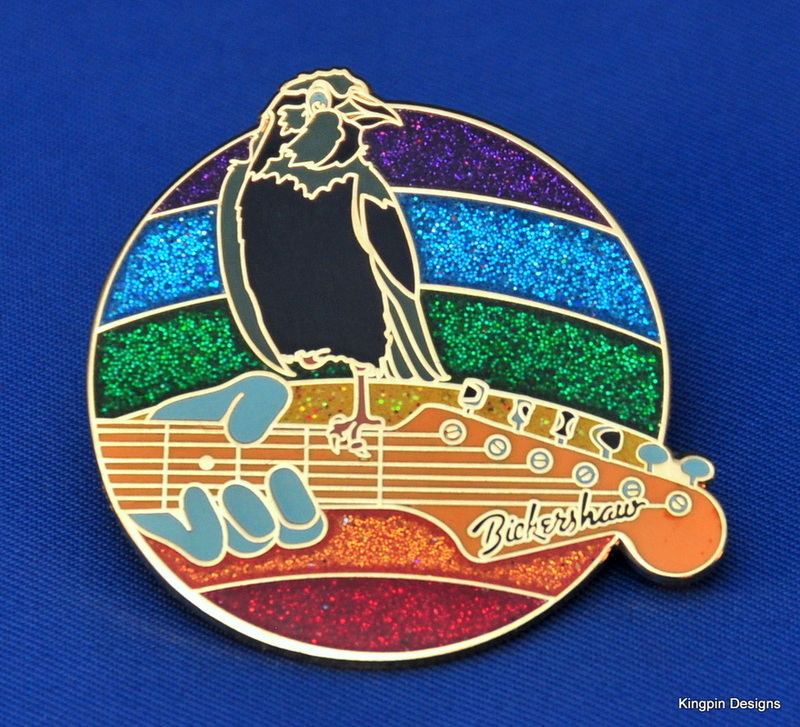 This pin is 1.5 inches tall hard enamel finished in polished gold. It is stamped on the back with the GDP trademark 2015, the Europe '72 Pin Set logo, and the Kingpin Designs logo. 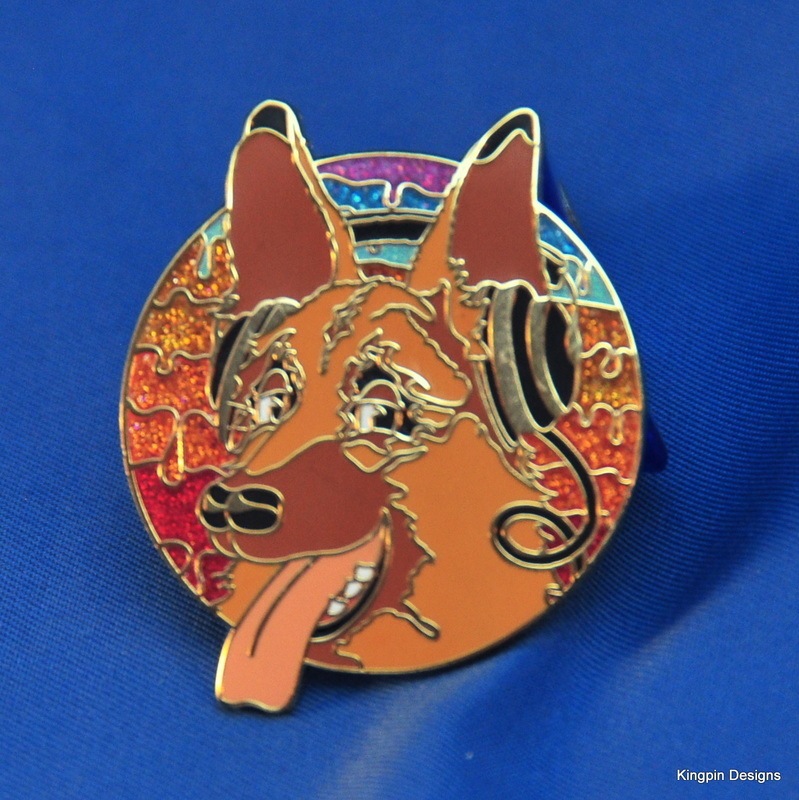 Each pin is individually numbered out of 200.The reflections this pin creates makes it difficult to capture in photos, so see the images below for additional views in different light. 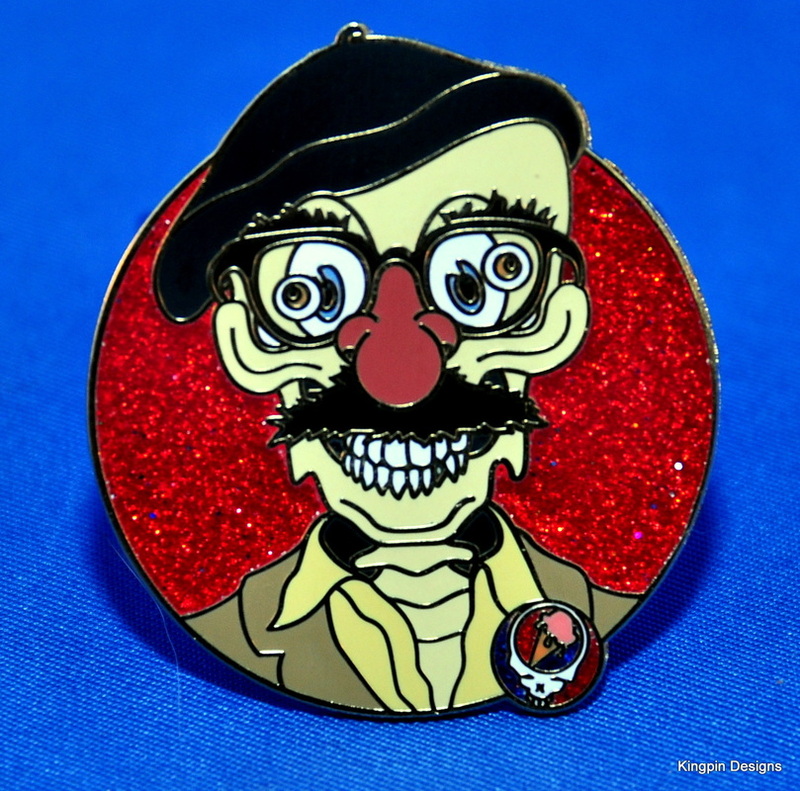 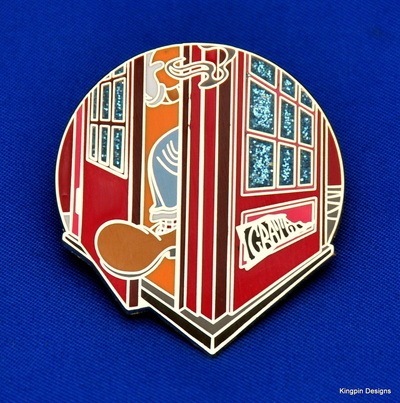 Pin #13 of the Europe '72 series features the artwork from the Complete Recordings Boxed Set for the twelfth night of the tour, L'Olympia, Paris 5/4/1972 (follow the link for more info or to purchase a recording of the show). This pin is 1.5 inches tall hard enamel finished in polished gold. 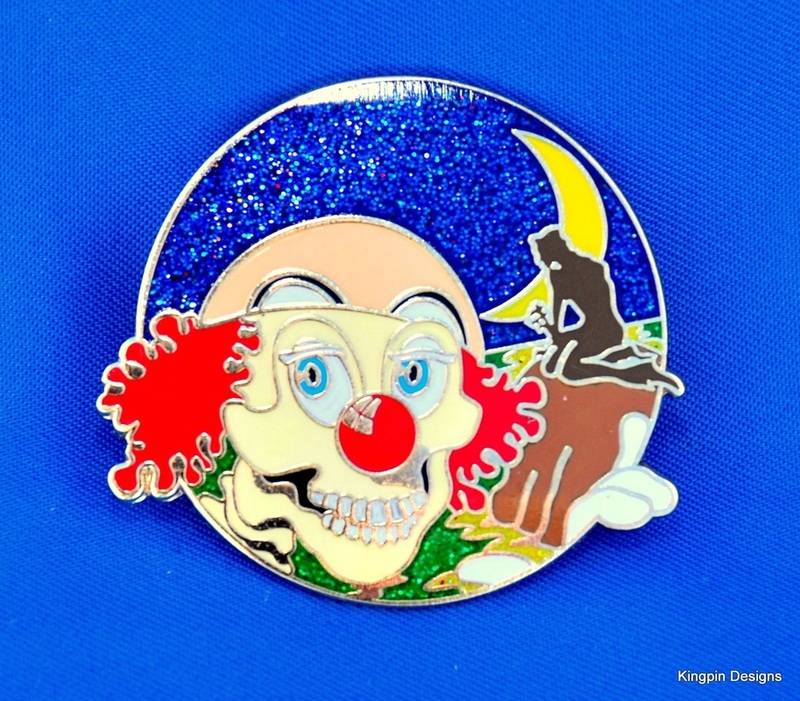 It is stamped on the back with the GDP trademark 2016, the Europe '72 Pin Set logo, and the Kingpin Designs logo. Each pin is individually numbered out of 200.The reflections this pin creates makes it difficult to capture in photos, so see the images below for additional views in different light. 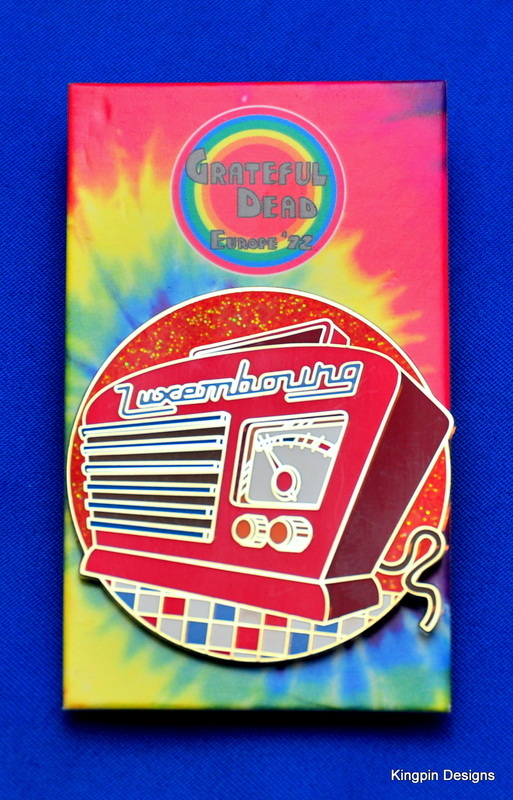 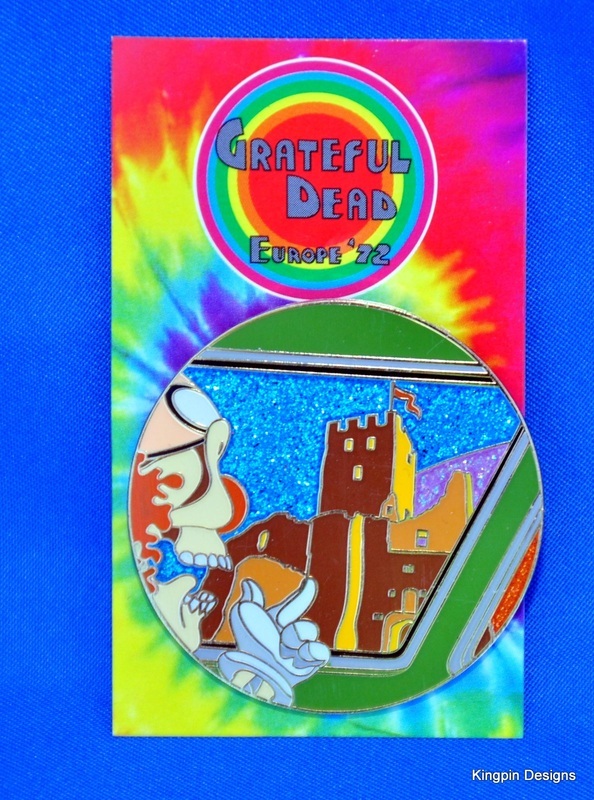 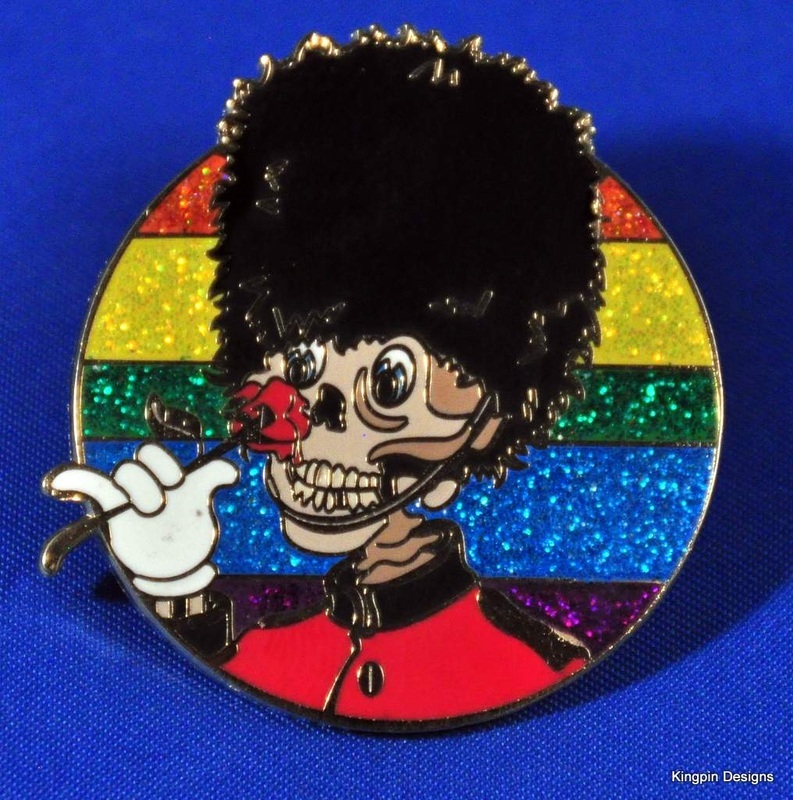 Pin #14 of the Europe '72 series features the artwork from the Complete Recordings Boxed Set for the thirteenth night of the tour, Wigan, England 5/7/1972 (follow the link for more info or to purchase a recording of the show). 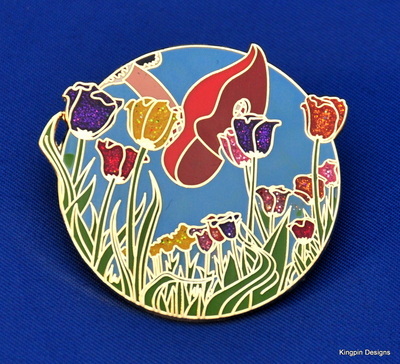 This pin is 1.5 inches tall hard enamel finished in polished gold. 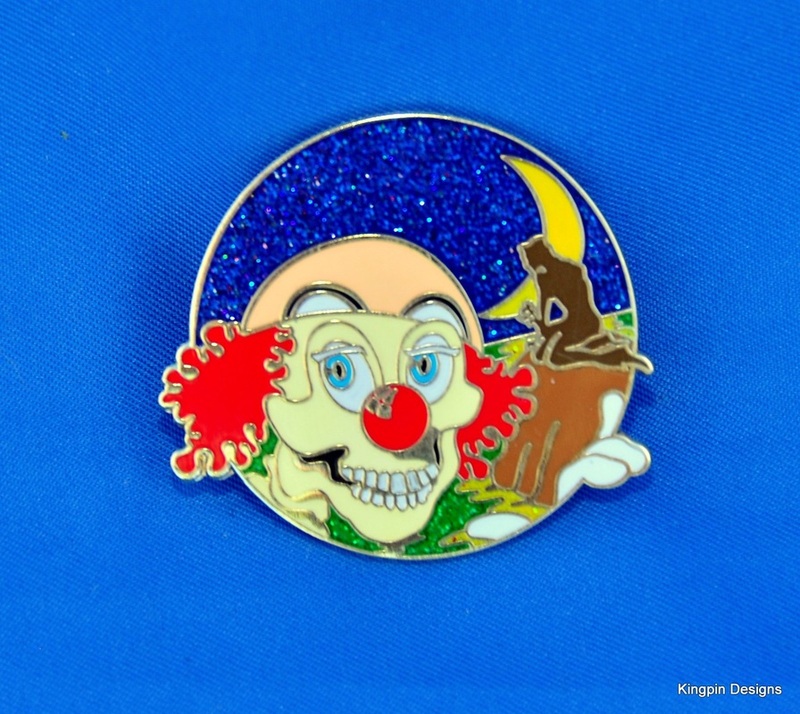 It is stamped on the back with the GDP trademark 2016, the Europe '72 Pin Set logo, and the Kingpin Designs logo. Each pin is individually numbered out of 200.The reflections this pin creates makes it difficult to capture in photos, so see the images below for additional views in different light. 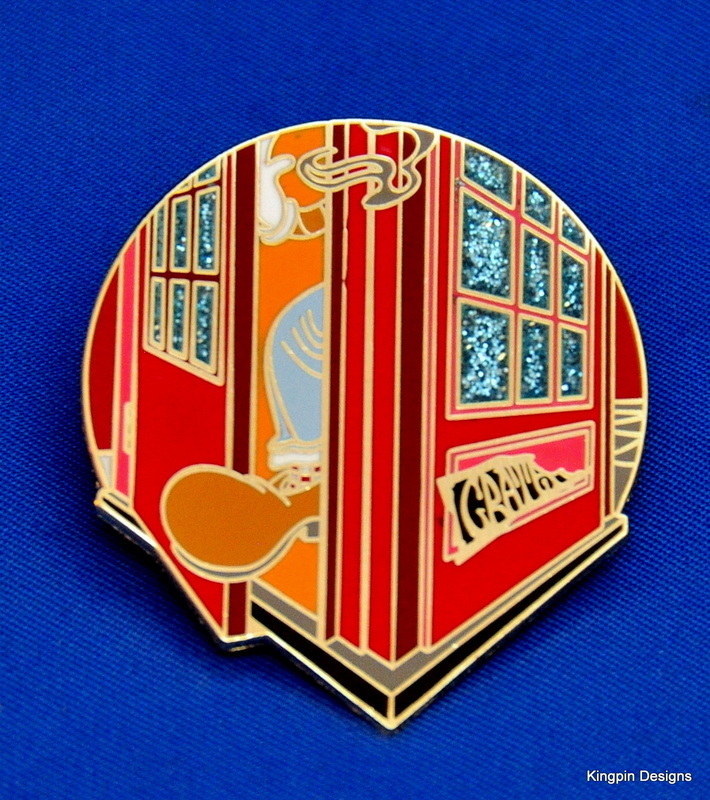 Pin #15 of the Europe '72 series features the artwork from the Complete Recordings Boxed Set for the fourteenth night of the tour, Concertgebouw, Amsterdam 5/10/1972 (follow the link for more info or to purchase a recording of the show). This pin is 1.5 inches tall hard enamel finished in polished gold. It is stamped on the back with the GDP trademark 2016, the Europe '72 Pin Set logo, and the Kingpin Designs logo. Each pin is individually numbered out of 200.The reflections this pin creates makes it difficult to capture in photos, so see the images below for additional views in different light. 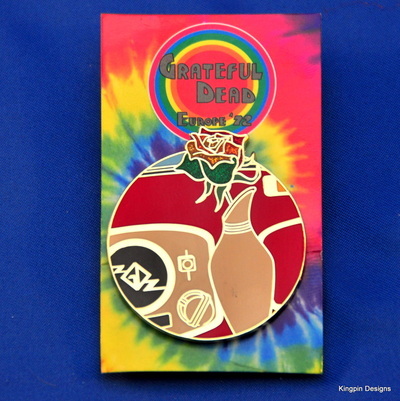 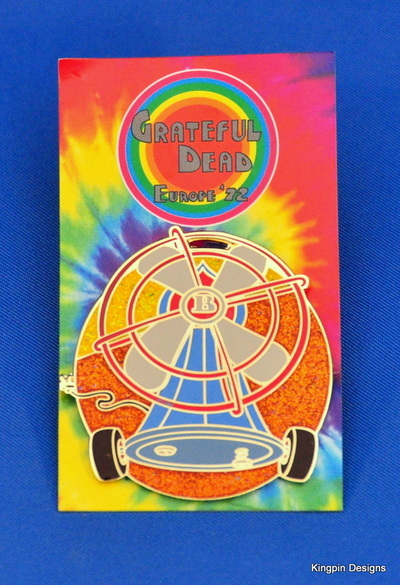 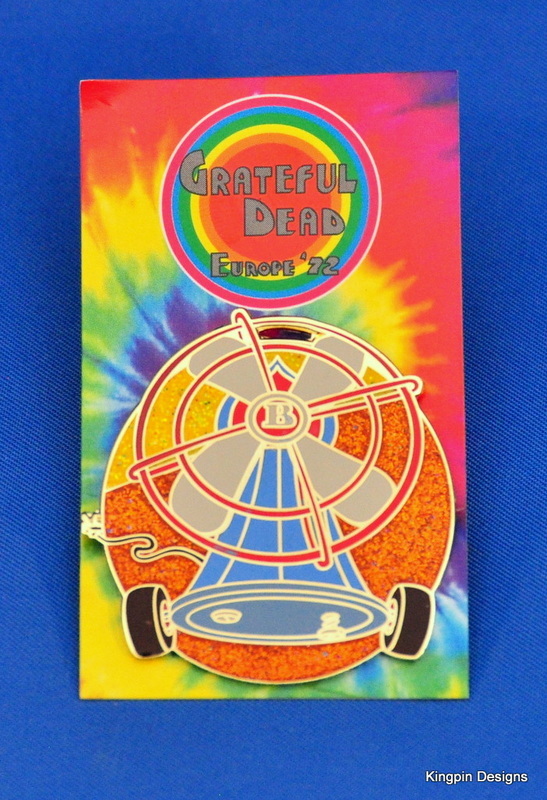 Pin #16 of the Europe '72 series features the artwork from the Complete Recordings Boxed Set for the fifteenth night of the tour, De Doelen, Ratterdam 5/11/1972 (follow the link for more info or to purchase a recording of the show). 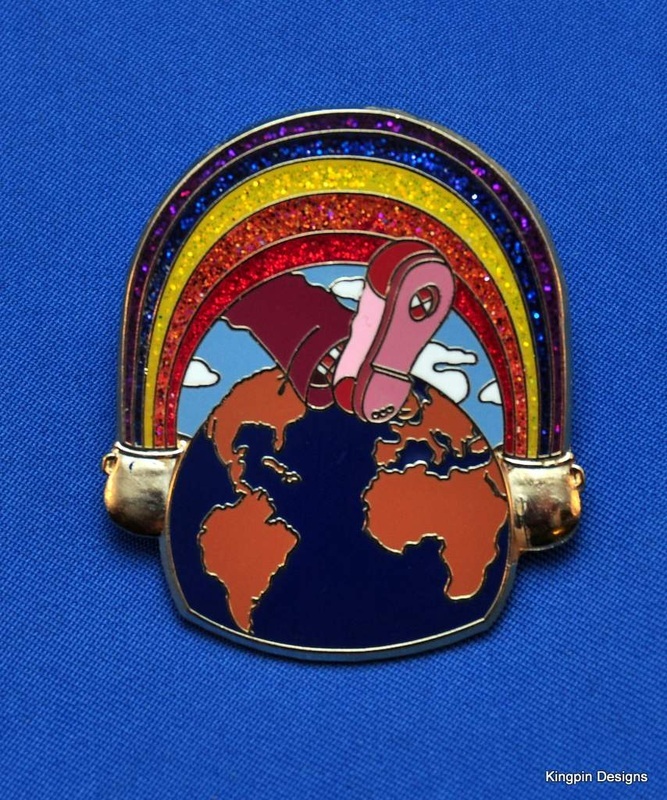 This pin is 1.5 inches tall hard enamel finished in polished gold. 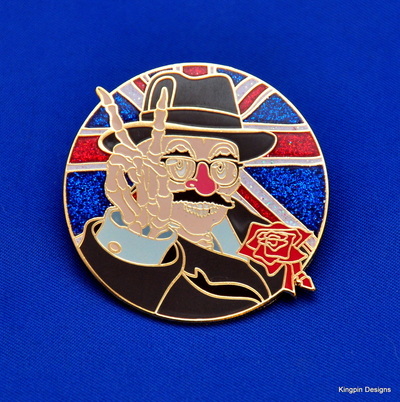 It is stamped on the back with the GDP trademark 2016, the Europe '72 Pin Set logo, and the Kingpin Designs logo. Each pin is individually numbered out of 200.The reflections this pin creates makes it difficult to capture in photos, so see the images below for additional views in different light. 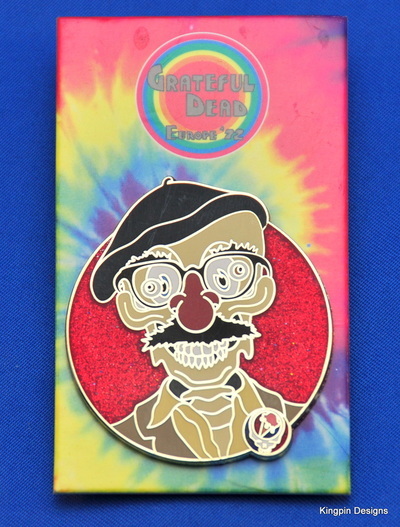 Pin #17 of the Europe '72 series features the artwork from the Complete Recordings Boxed Set for the sixteenth night of the tour, L'Esplanade de Lille, Lille, France 5/13/1972 (follow the link for more info or to purchase a recording of the show). This pin is 1.5 inches tall hard enamel finished in polished gold. It is stamped on the back with the GDP trademark 2016, the Europe '72 Pin Set logo, and the Kingpin Designs logo. 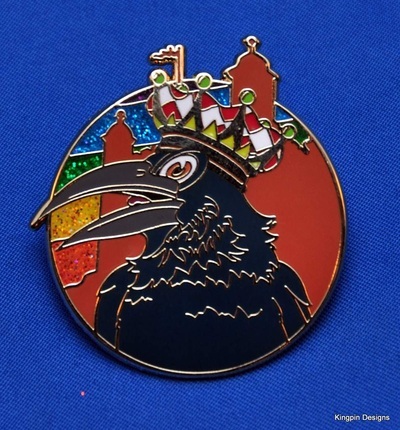 Each pin is individually numbered out of 200.The reflections this pin creates makes it difficult to capture in photos, so see the images below for additional views in different light. 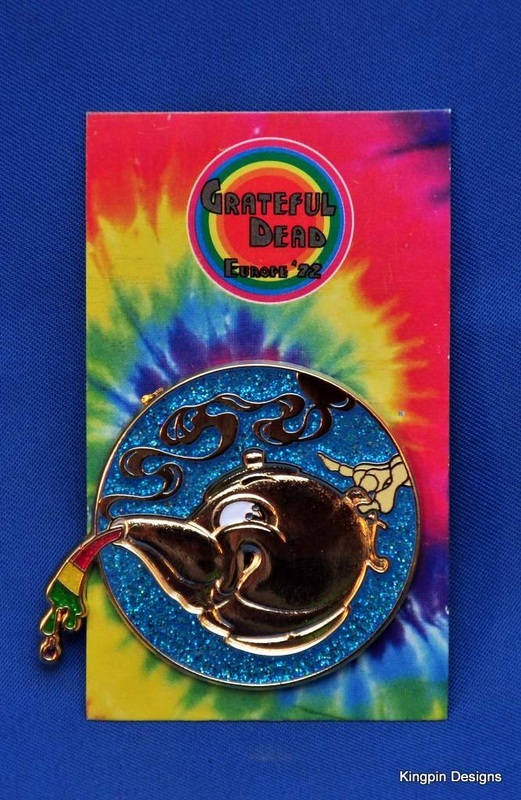 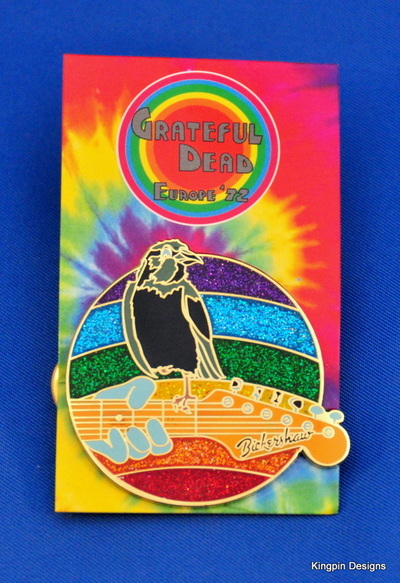 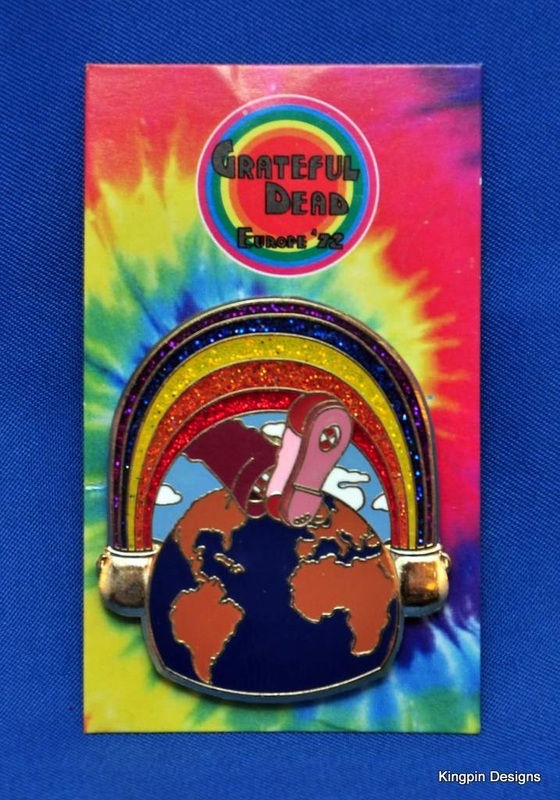 Pin #18 of the Europe '72 series features the artwork from the Complete Recordings Boxed Set for the seventeenth night of the tour, Studio du Grand Theatre de la ville de Luxembourg, Luxembourg 5/16/1972. 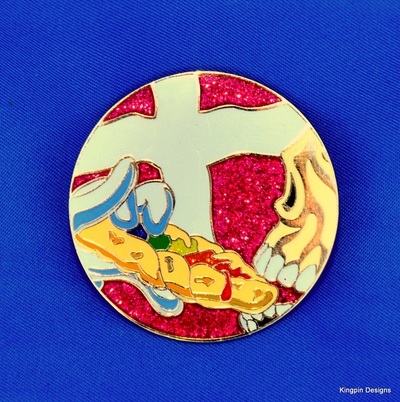 This pin is 1.5 inches tall hard enamel finished in polished gold. It is stamped on the back with the GDP trademark 2016, the Europe '72 Pin Set logo, and the Kingpin Designs logo. 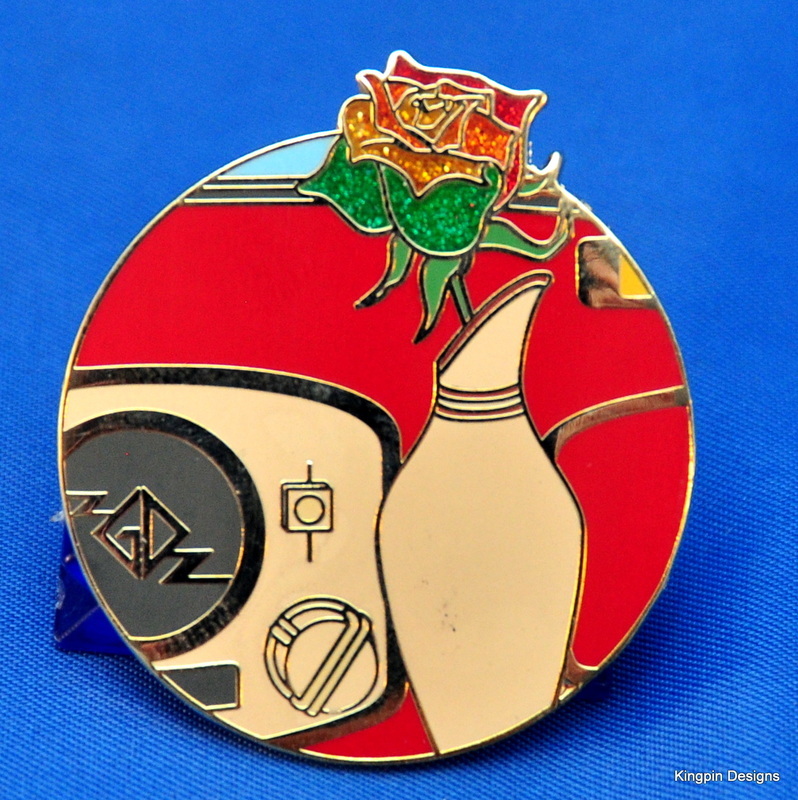 Each pin is individually numbered out of 200.The reflections this pin creates makes it difficult to capture in photos, so see the images below for additional views in different light. 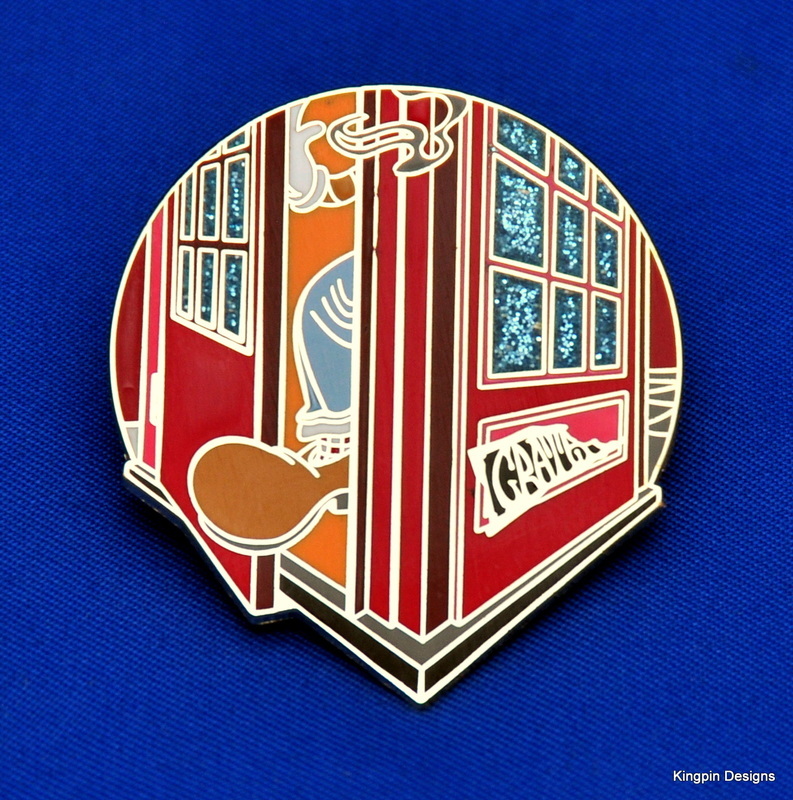 Pin #19 of the Europe '72 series features the artwork from the Complete Recordings Boxed Set for the eighteenth night of the tour, Kongresssaal, Munich, West Germany 5/18/1972 (follow the link for more info or to purchase a recording of the show).. 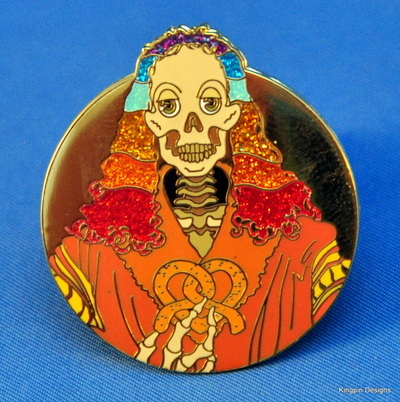 This pin is 1.5 inches tall hard enamel finished in polished gold. It is stamped on the back with the GDP trademark 2016, the Europe '72 Pin Set logo, and the Kingpin Designs logo. 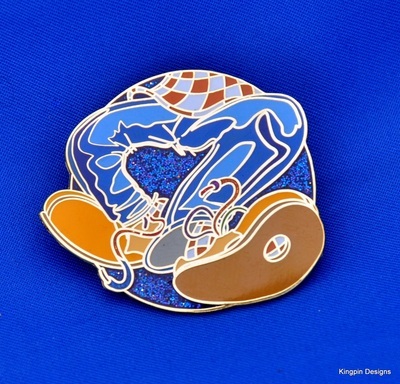 Each pin is individually numbered out of 200.The reflections this pin creates makes it difficult to capture in photos, so see the images below for additional views in different light. 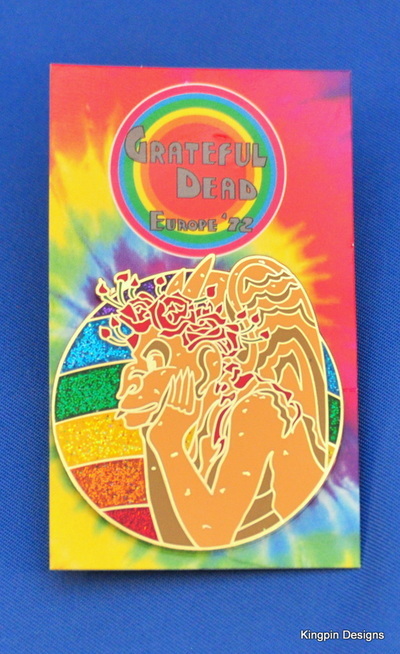 Pin #20 of the Europe '72 series features the artwork from the Complete Recordings Boxed Set for the nineteenth night of the tour, ﻿Strand Lyceum, London, England 5/23/1972﻿ (follow the link for more info or to purchase a recording of the show).. 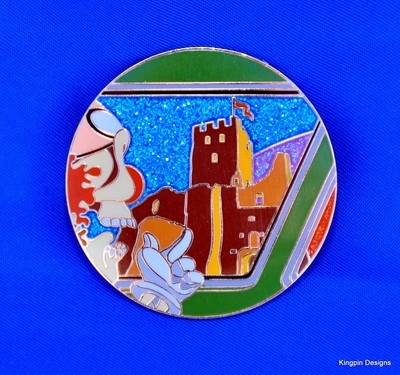 This pin is 1.5 inches tall hard enamel finished in polished gold. It is stamped on the back with the GDP trademark 2016, the Europe '72 Pin Set logo, and the Kingpin Designs logo. 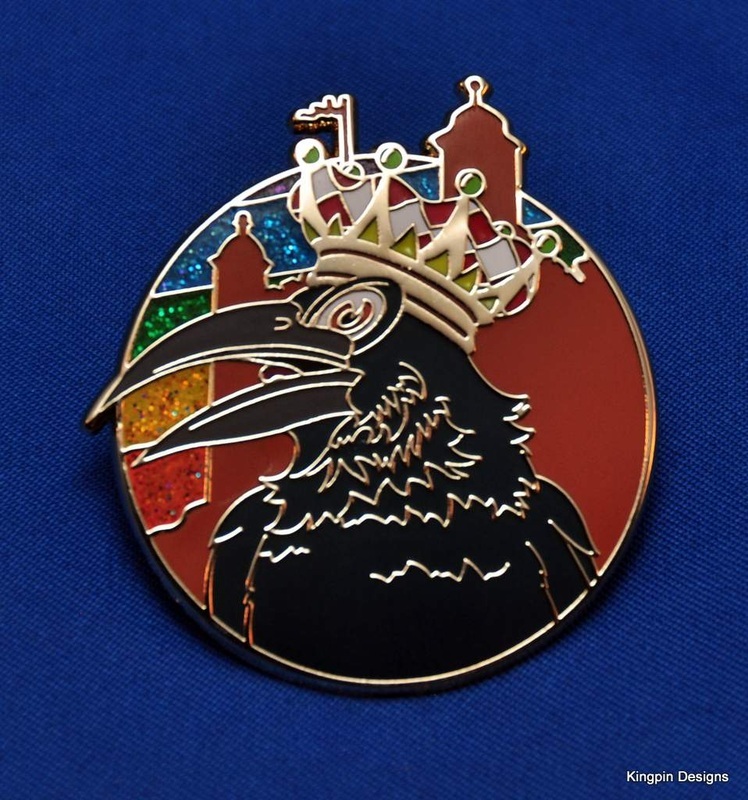 Each pin is individually numbered out of 200.The reflections this pin creates makes it difficult to capture in photos, so see the images below for additional views in different light. 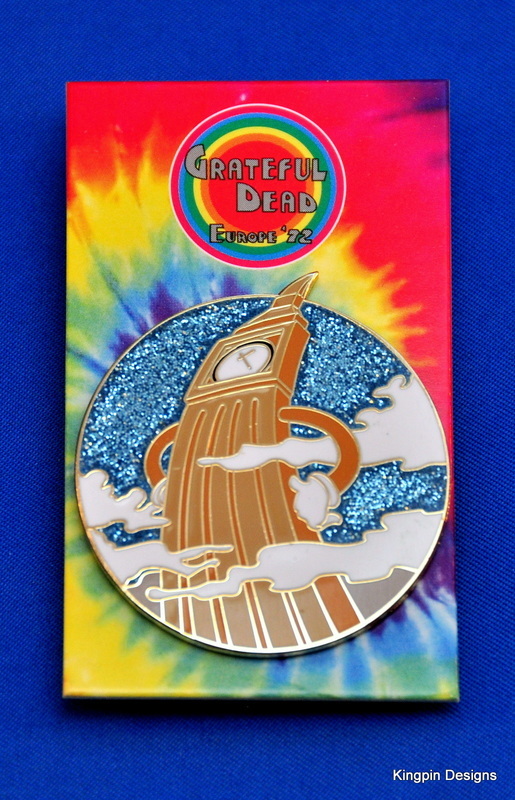 Pin #21 of the Europe '72 series features the artwork from the Complete Recordings Boxed Set for the twentieth night of the tour, ﻿Strand Lyceum, London, England 5/24/1972﻿ (follow the link for more info or to purchase a recording of the show).. This pin is 1.5 inches tall hard enamel finished in polished gold. It is stamped on the back with the GDP trademark 2016, the Europe '72 Pin Set logo, and the Kingpin Designs logo. 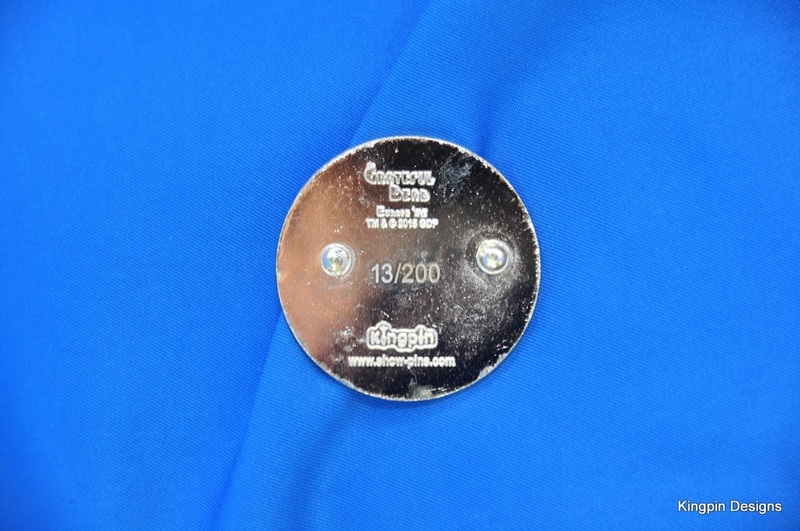 Each pin is individually numbered out of 200.The reflections this pin creates makes it difficult to capture in photos, so see the images below for additional views in different light. Pin #22 of the Europe '72 series features the artwork from the Complete Recordings Boxed Set for the twentieth night of the tour, ﻿Strand Lyceum, London, England 5/25/1972﻿. 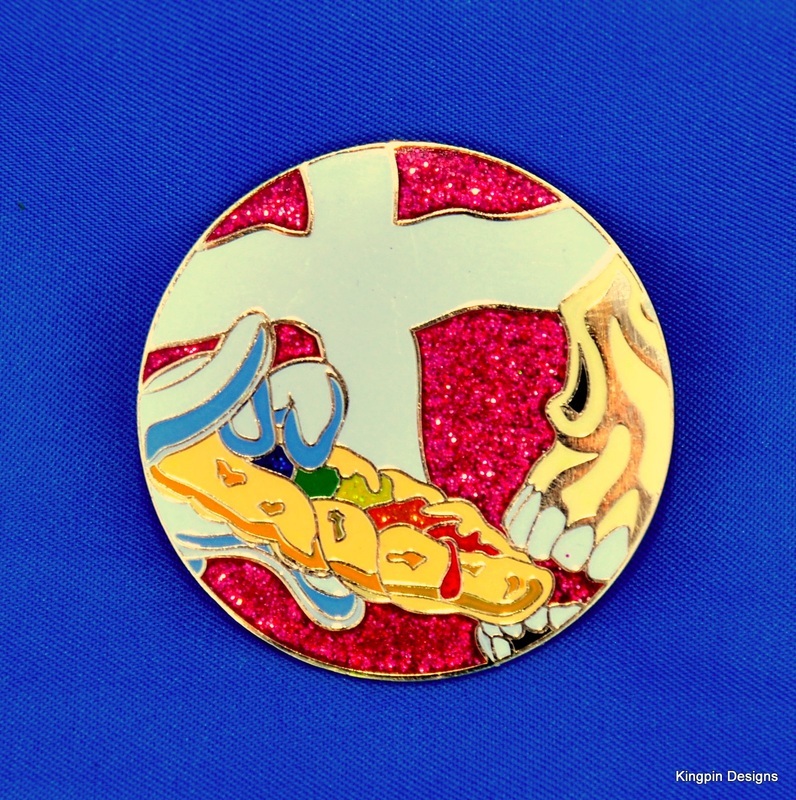 This pin is 1.5 inches tall hard enamel finished in polished gold. 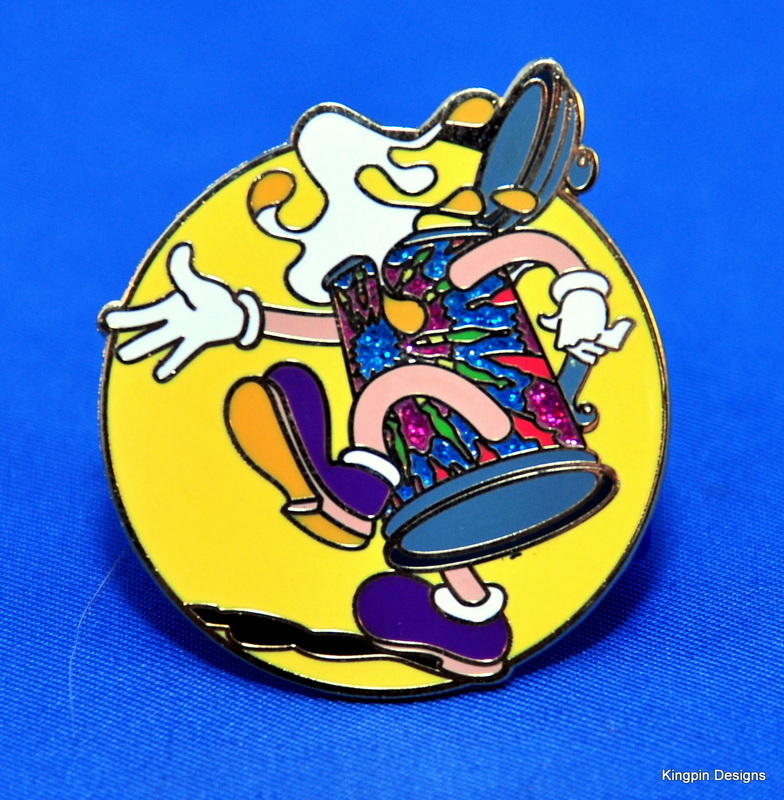 It is stamped on the back with the GDP trademark 2016, the Europe '72 Pin Set logo, and the Kingpin Designs logo. 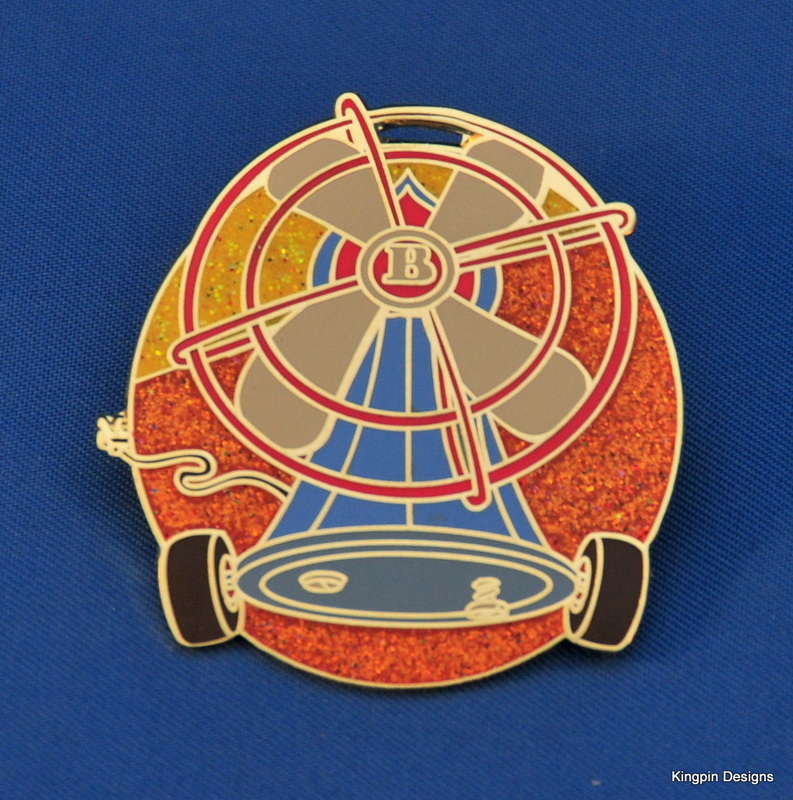 Each pin is individually numbered out of 200.The reflections this pin creates makes it difficult to capture in photos, so see the images below for additional views in different light. 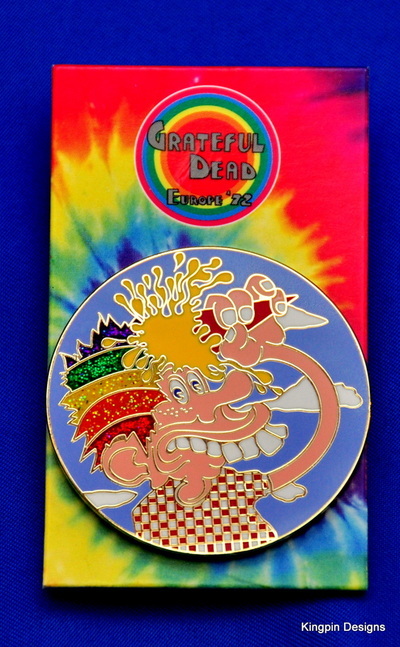 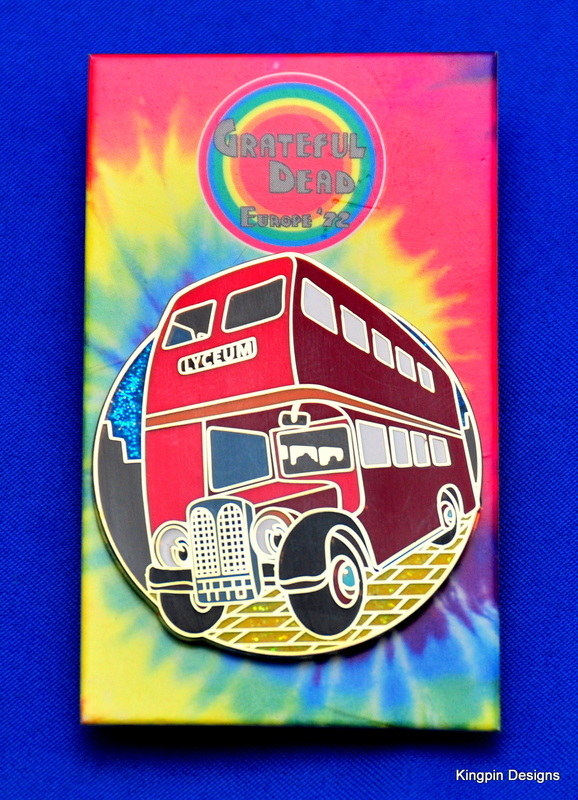 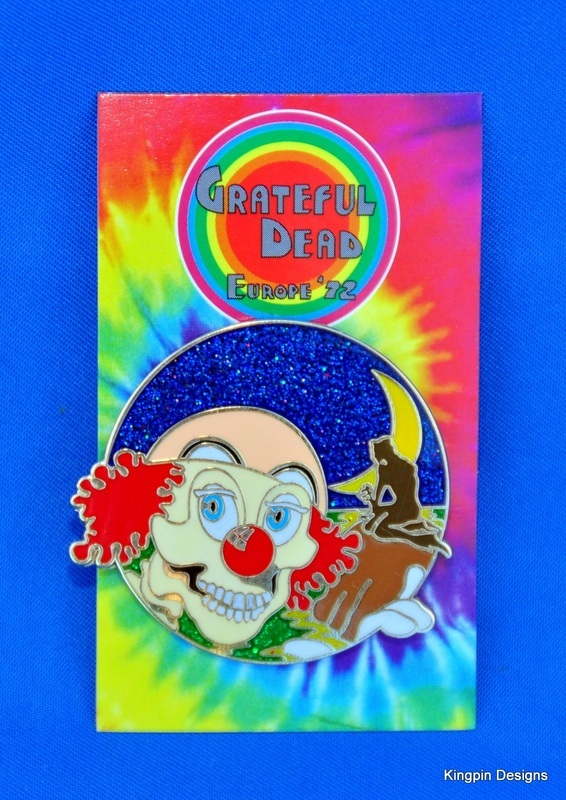 Pin #23 of the Europe '72 series features the artwork from the Complete Recordings Boxed Set for the twentieth night of the tour, ﻿Strand Lyceum, London, England 5/26/1972﻿. 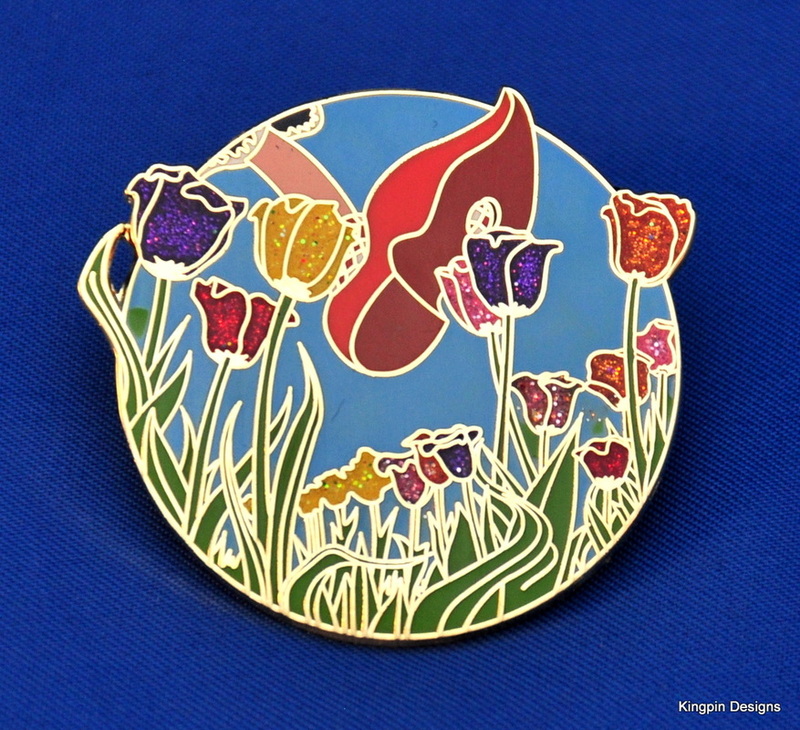 This pin is 1.5 inches tall hard enamel finished in polished gold. 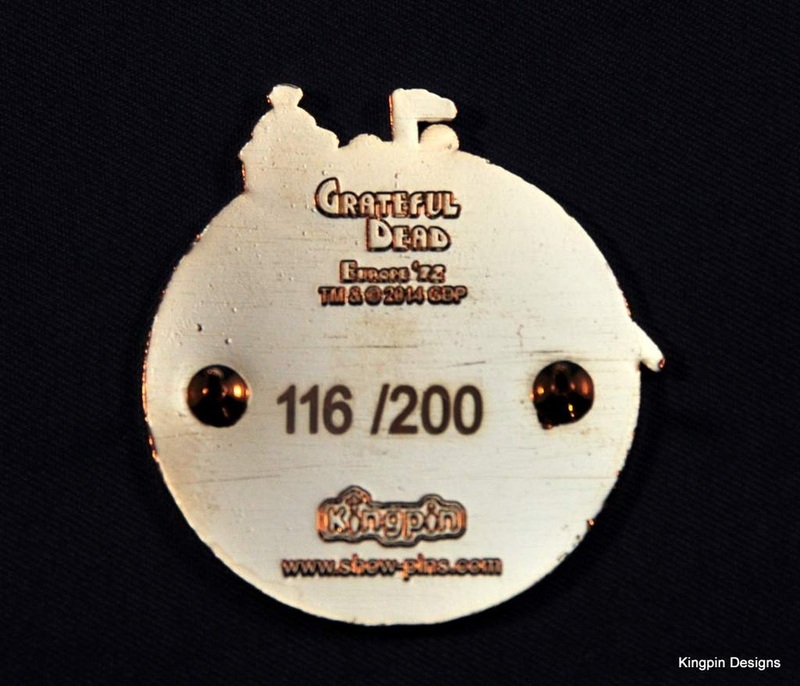 It is stamped on the back with the GDP trademark 2016, the Europe '72 Pin Set logo, and the Kingpin Designs logo. 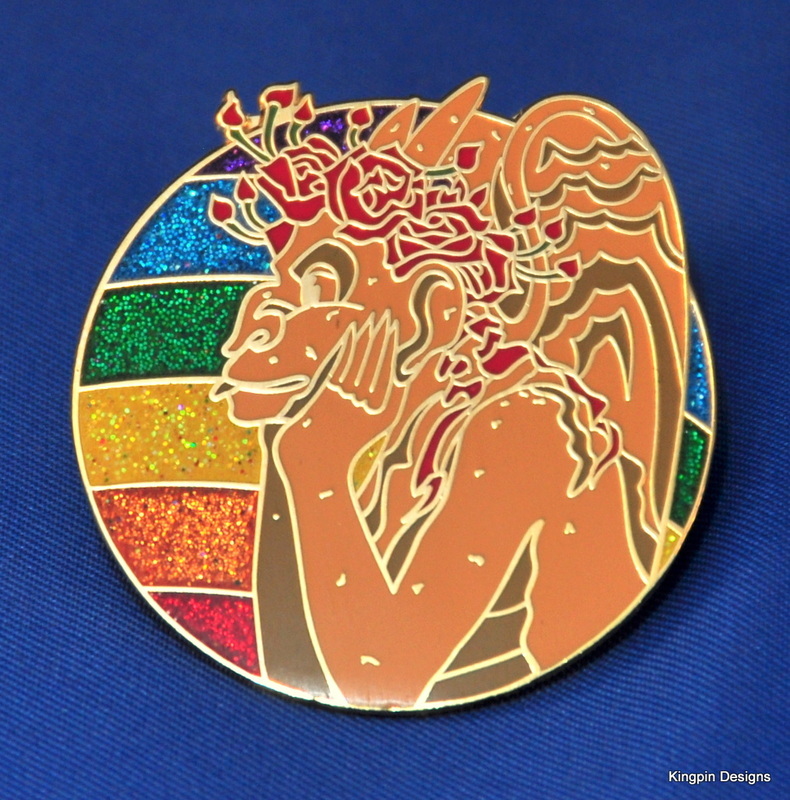 Each pin is individually numbered out of 200.The reflections this pin creates makes it difficult to capture in photos, so see the images below for additional views in different light. 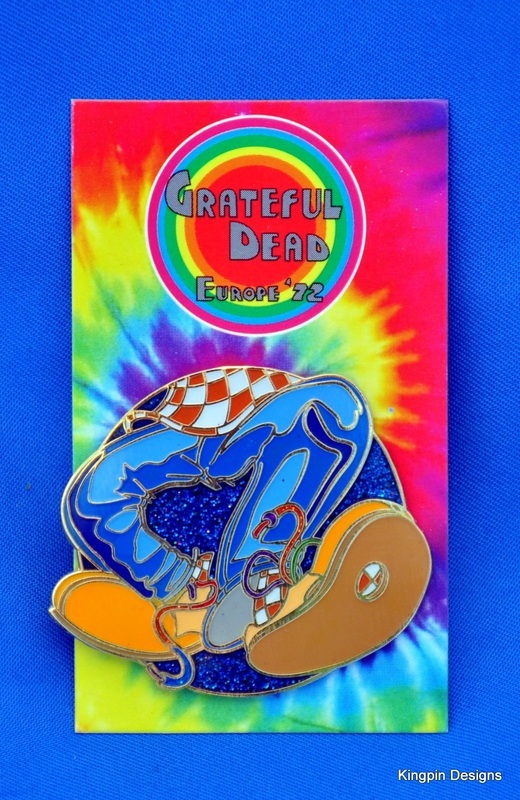 Pin #24 of the Europe '72 series features the original Kelly/Mouse album artwork from the back of the legendary 1972 triple live album released on Nov 5th, 1972. The only officially licensed Ice Cream Kid pin from GDP is 1.5 inches tall hard enamel finished in polished gold. 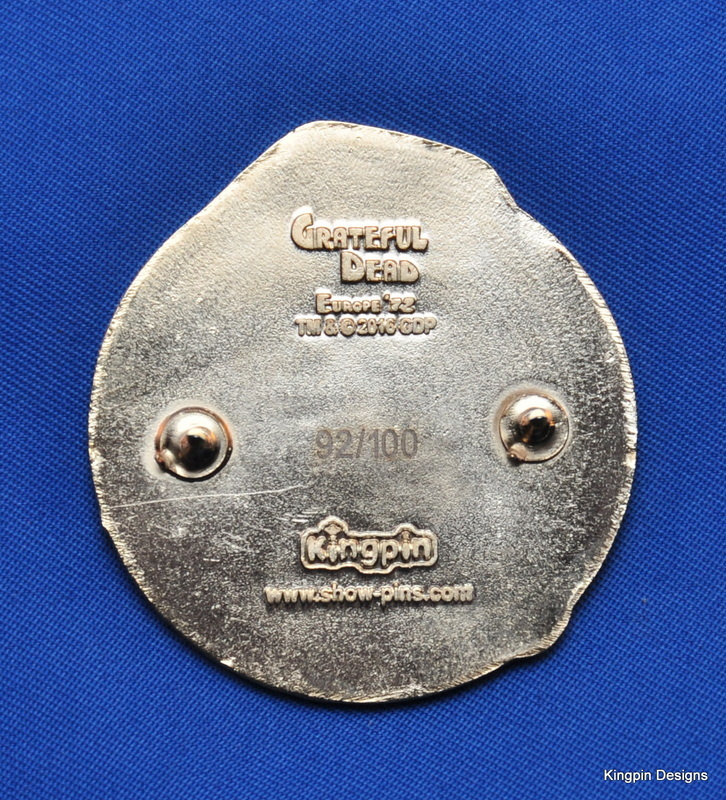 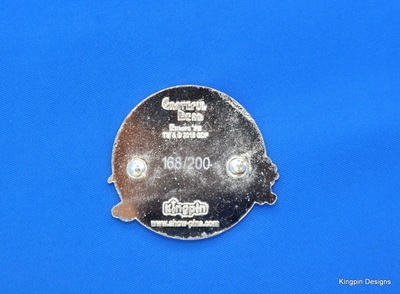 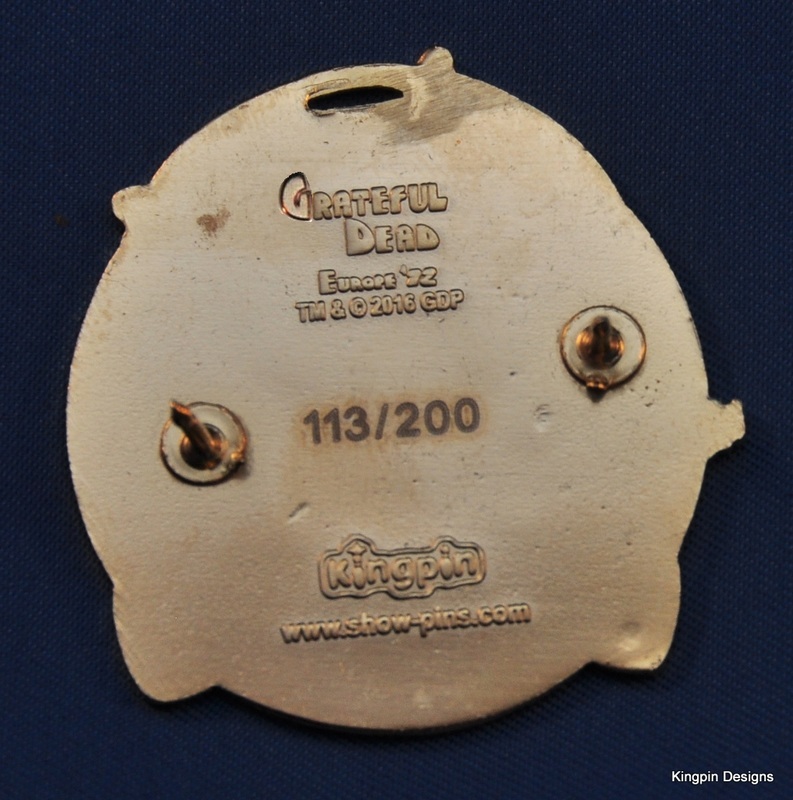 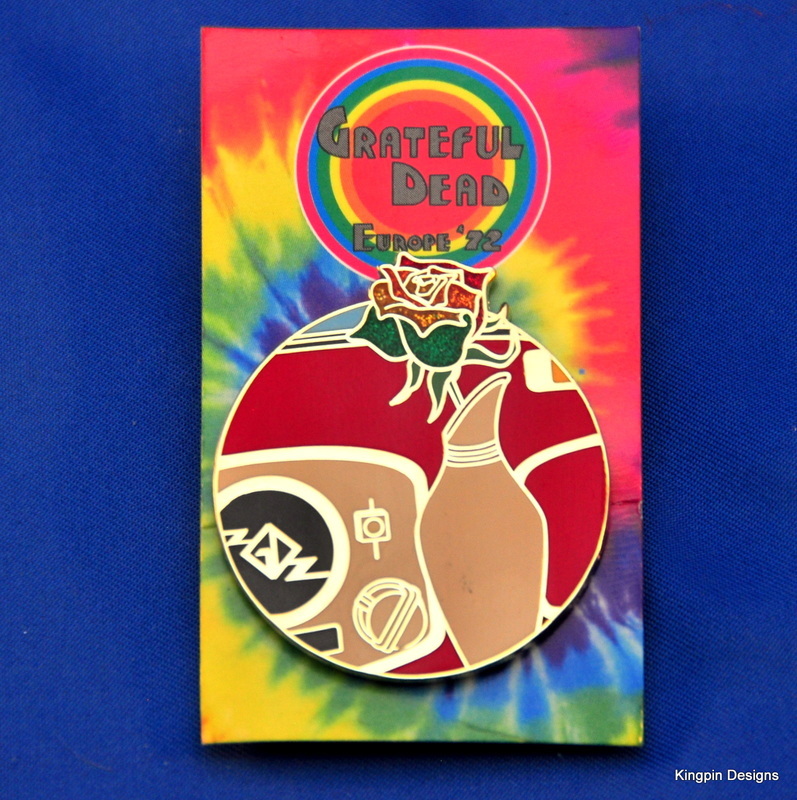 It is stamped on the back with the GDP trademark 2014, the Europe '72 Pin Set logo, and the Kingpin Designs logo. Each pin is individually numbered out of 200.